I realised that I'm in my 30's and there never seems to be enough time for anything. I made time to do what I love. I make glass beads, known as lampworking and beaded jewellery, known as bead embroidery. For this test I did not batch anneal, I’m using my Paragon which allows me to go flame to kiln. 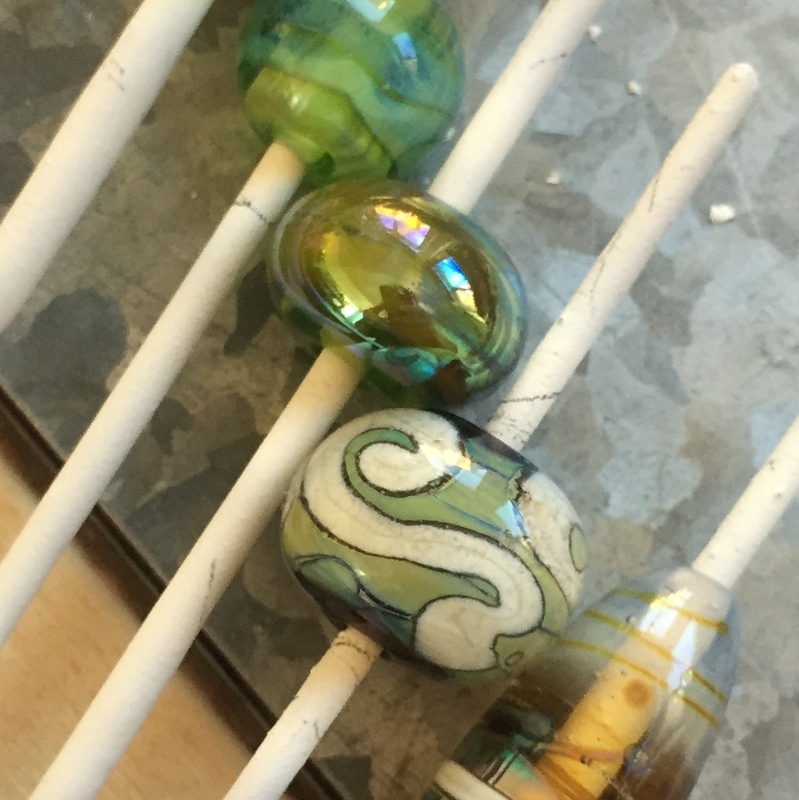 I have set my kiln up specifically to anneal large beads for soda lime and silver glass. I don’t have any “before” photos but I can say with confidence that every single bead made with To.b struck a tad more in the kiln, so keep that in mind when you’re encasing your bead, keep it cool and encase slowly so that the bead doesn’t overheat. To.b is probably a test production of a batch of glass that eventually became Thallo, its obviously one of those test batches that was near to the mark, but not quite it. The code indicates that it belongs to the Thallo family, but there is a good reason for why it is a test batch that didn’t make the grade. I didn’t find this glass particularly easy to use, I’m not sure what other people have experienced. Personally, it is not that To.b is particularly hard to get a reaction from, it’s more that the window of opportunity to pull a nice colour from the glass is quite small and over heating either in the flame or the kiln will rob you of a beautiful bead. I’m sure if I had another rod of To.b I probably would have got it to produce some really nice results but it was quite finicky to get anything near to what Thallo can produce for a first time user. Essentially, I found two ways to use To.B that yields nice results. The first is encasing To.b on top of black and reducing for a metallic super lustre shine. The second is to wrap To.b around a core of clear glass, reduce multiple times and encase for that opalescent and iridescent effect. Essentially, I used the tricks that are known to get Thallo to produce good results with To.b and I found that some of these tricks apply well. There are other interesting things about To.b that will probably translate across to Thallo as well. Firstly, To.b hates CiM Hades. I mean hates it. Some of the Double Helix range works beautifully on Hades because it tends to hold a lot of heat, but To.b isn’t one of them. Lets talk about the beads on the left in the picture. 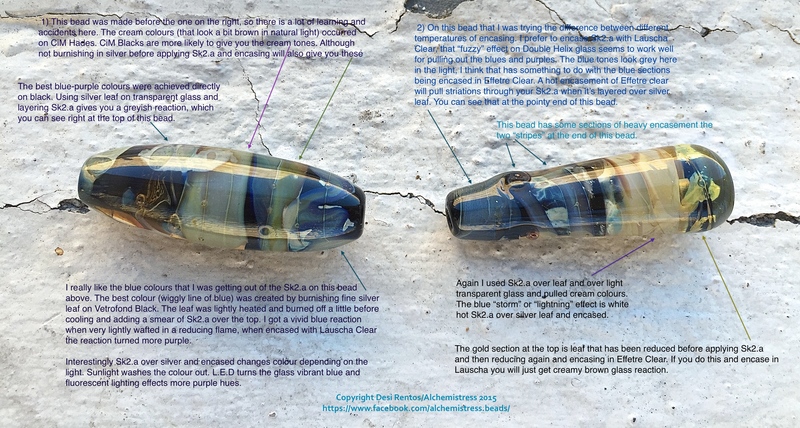 The top bead (darker blue) is a base of CiM Hades, a wrap of To.b that underwent one light reduction, before being encased in Effetre Clear, everything stayed warm, with only a brief cooling phase between striking and encasing. I can’t say that is what I expected to get, but I didn’t get a particularly strong lustre on the top of Hades so it stands to reason that what was encased wasn’t so great either. Only later when I used Vetrofond Black and discovered just how intense the lustre should be did I realise that Hades and To.b are not friends. Nevermind, moving along to the paler green bead. Same method as above, but this one had repeated reductions between cooling. Perhaps I didn’t cool the bead enough, or perhaps the Hades was just holding a lot of heat that day but the Hades wanted to web over the To.b and the whole effect just wasn’t worth persisting with. I’m not a fan of having to work hard to make glass do something, so I’m canning this combination. Much more striking results when To.b is used over Vetrofond Black. This bead is encased with Effetre Clear, which wasn’t pickled. But To.b over Vetrofond Black (which is similar to Effetre Black) produces much nicer results, as you can see from the picture to your right. This bead got the same treatment as the dark blue and Cim Hades bead in photo one. The first difference is just how much more depth and vibrancy To.b has over Vetrofond Black, the second (even though you can’t tell in this photo) is that it kept some of that lovely opalescence under the encasement. It was about the fourth bead where I realised that I was probably encasing To.b too hot, which is one of the problems with Effetre Clear, you need to get it stinking hot so that it encases nicely. I honestly thought I’d get a lot more green out of To.b, so I was really surprised to see all this blue, I was pretty sure I was going to get a green super lustre but perhaps that is the nature of To.b on black? Well I found out later, that of course it is. Looking at the etymology of the word Thallo, which probably has its roots in the Greek word Thalaso, this word translated directly means ‘sea’. Some sea’s are green, some are blue and Homer would have you believe the sea is “wine dark”. So blue it is… for now. A base of Vetro Black, layer of To.b reduced, dotted with Eff. Clear and voila, a rock pool! I’m going to go out on a limb here (because I haven’t personally tested this theory) and suggest that if you have To.b or even Thallo and you want to use it over black I would be picking a dense non reactive black, such as Reichenbach (preferably) or Effetre or even Vetrofond Black. A stable dense black seems to provide a better surface, avoid “soft” blacks. Layer your To.b on the black and after a few flashes in a cool reduction flame encase in Double Helix Zephyr to maintain the opalescence. I’m suggesting Zephyr because it doesn’t need to be really hot to encase smoothly. To.b seems finicky to work with, so if you have a load of it and want to use it on black, then go with the more expensive clear and black glass brands to make it sing. I haven’t used Thallo, but going through other peoples notes on this colour, they don’t say its a hassle. So this could be one of the reasons why To.b is a test batch that never made the grade, its a bit of a hassle. Its hard to tell in a photograph but the bead to the above left captured some of that opalescent flash under the dots, when the bead turns the dots shift and the colour moves, which is really lovely. It looks as if I’ve trapped a tiny bit of water under the encasement. In summary, using To.b on black will turn it blue and the metallic sheen that appears on the bead before you encase is a dark olive to metallic blue colour, depending on how many reduction passes given to the surface. Whatever blue appears under encasement is completely down to heat control. Less heat, more intense royal or peacock blue colours and opalescence and iridescence. More heat, more washed out sea greens and faded denim blue with very little or no opalescence or iridescence. To.b produces startlingly different results (compares to using it on black) when paired with a clear glass base. About halfway through my testing, I finally saw the green that To.b is supposed to produce. Namely, To.b on top of clear will give you greenish hues. I played around with this concept using various light transparent base colours and expecting to get variations on the effect that clear glass produces, but it didn’t quite work out in the same way. Looking to the green beads on the right, the metallic donut bead is a base of Effetre Clear with the layer of To.b cooled and reduced several times, the metallic layer is quite pretty shifting from green to peacock green to gold. The little round green bead has a base of Lauscha Superclear then a messy wrap of To.b, which has been lightly reduced multiple times, it turned all of the bead a greeny, amber colour (kind of what I imagine sunlight hitting a green sea would look like). 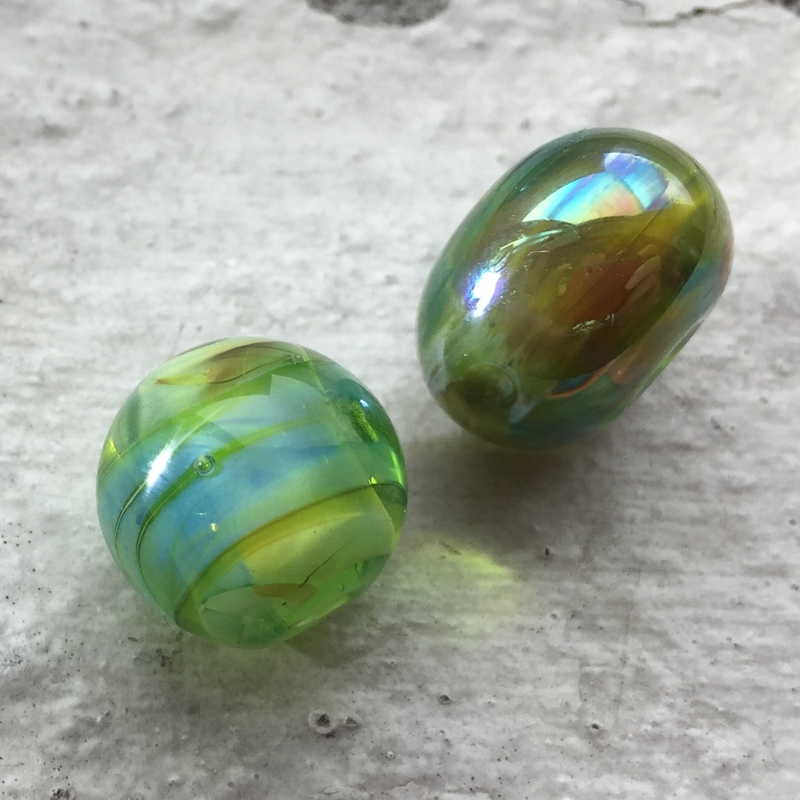 The entire bead is then encased in Lauscha Superclear, the part where the To.b was layered turned an ethereal blue green and the rest of the bead fumed green. It appears that there is a reaction line between To.b and the Lauscha superclear and I think it is caused by the silver fuming the clear glass strongly at where To.B and Lauscha Superclear meet. I like the little green bead, even though it’s not a perfect example of what To.b can do, you get the idea that in the right set of hands an artist could really make the most of that floating wispy opalescence, but not me, not today. Its summer in Australia and that means its too damn hot to do anything right. I will have to buy some Thallo and make a set with this idea behind it when the weather cools down to something respectable. Cooled test beads out of the kiln and needing to be cleaned. The top two beads are the same two in the photo above, the metallic bead is lovely. 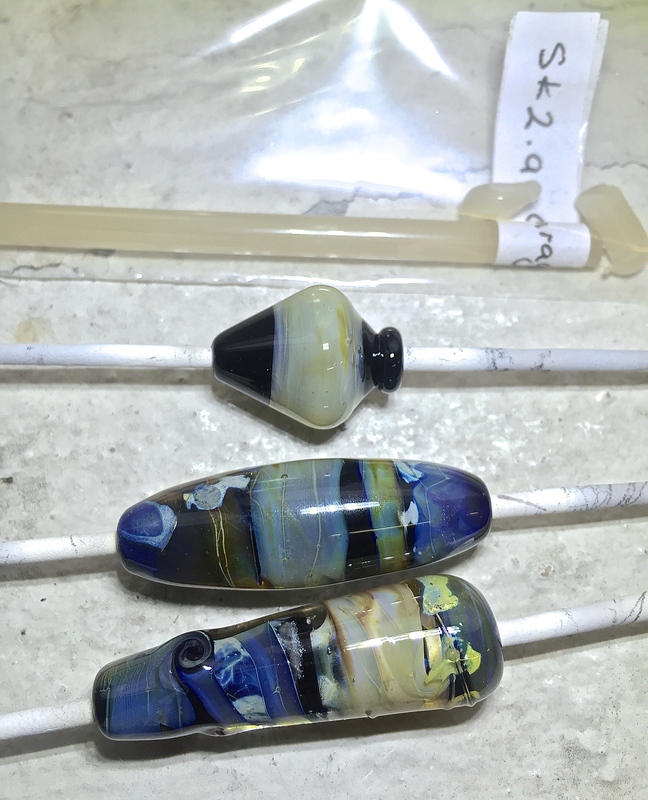 These beads to the left (showing the two beads explained above) have just come out of the kiln. What is important about this picture is the third bead with the Effetre Ivory squiggle. 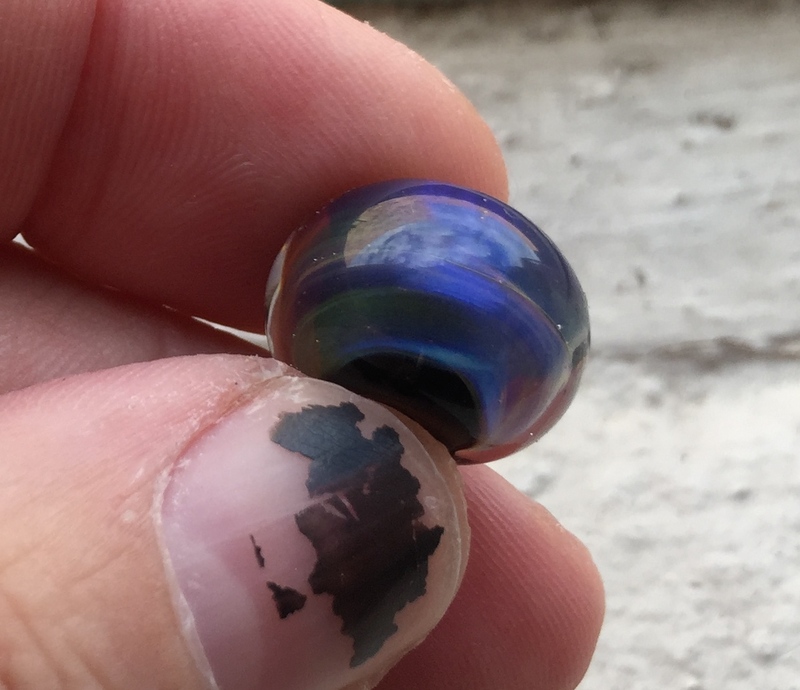 That bead went into the kiln fine, it came out of the kiln fine then over the course of three weeks it developed stress fractures. I don’t think it has anything to do with how I made the bead, they look like the type of cracks you get due to incompatibility and they are, I never knew that Effetre Ivory doesn’t like to be encased, I can’t say I’ve ever had a reason to encase it but there you go. I did a search online to verify if this was true and yep, Effetre Ivory doesn’t like to be encased. So that explains why that bead went to hell. Now lets talk about that colour reaction on the squiggle bead. There is a photo below showing the crack that developed across the squiggle bead and it’s paired with another bead that developed cracks later whilst still on the mandrel. This black cone bead is encased with CiM Cirrus and only the part with To.b underneath cracked. Encasing in Cim Cirrus yields some beautiful opalescence, but not sure what it is, every time I got beads cracking. So, there is some slight incompatibility there with Cirrus encasing To.b. Uh oh… cracks. The Black bead is encased with CiM Cirrus. I decided that I was going to do another To.b test bead on a base of Effetre clear and encase it with Effetre to show a comparison to the bead made out of Lauscha. I decided for the hell of it, to squiggle a line of Ivory, which was really pretty when it was not encased. The thin stringer line spread out and reacted with To.b producing a dark fume line and a separation line down the middle (see pic above). I definitely should not have encased, because it looked great against the metallic surface of To.b. Anyhow, encasing in Effetre always seems to push the colour along far too much and you get that washed out brownish sea green effect, which is how To.b looks on black too under an Effetre encasement. So, another interesting point to note is that for To.b if you don’t have Zephyr on hand, Lauscha clear is better than Effetre for encasing and this is what I mean about To.b being finicky. If you really want to save yourself a lot of heart ache, I would wrap a sticky note with your batch of To.b so that if you ever pick up a rod of it, you can remember what its quirks are. 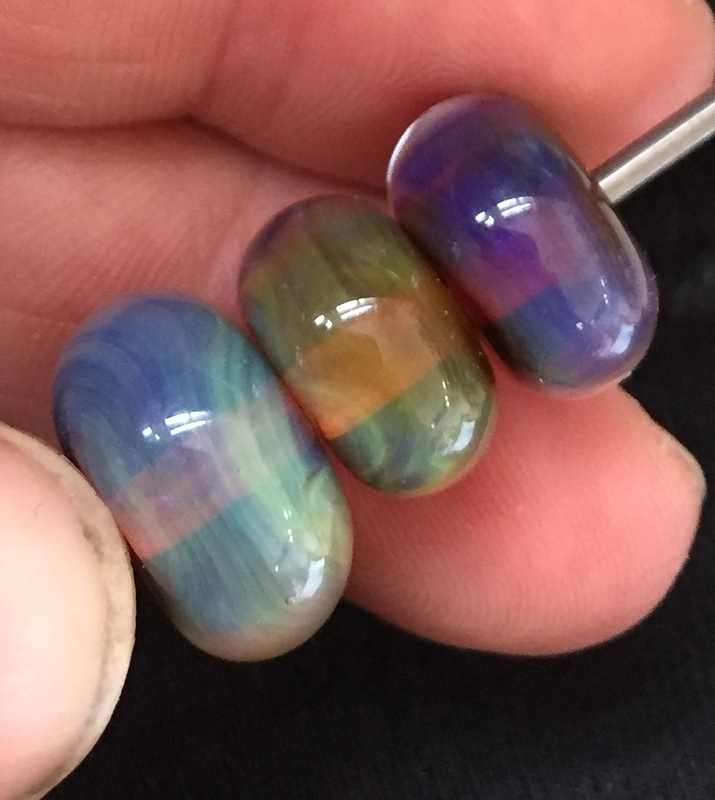 To the left is one of the beads I made after I was a bit disheartened with the testing phase, usually I can get some pretty nice effects in test beads but I just didn’t get anything that wowed me this time. This bead to the left is fairly nice and I’ll explain what is going on. Firstly, the base of this bead is Effetre Straw Yellow and CiM Cirrus, shaped in a CGBeads beadroller. I’ve trailed To.b all over the bead and lightly reduced several times. Where To.b landed on the Straw Yellow I got a metallic oil slick lustre, where it landed on the Cirrus I got stripes of yellow. Lastly, I wrapped a stringer of Effetre Ivory over the top of a section that had a wide band of To.b. I gave it all a slight wave in the reduction flame then tossed it into the kiln. The straw yellow did darken where To.b landed on it (particularly around the middle) so I got a nice graduation in the colour without meaning to. I wasn’t enthused about the reaction of To.b on Cirrus. Seeing as how I do love Cirrus so much, I used it again as the base for this bead along with Cim Thai Orchid. Once again I trailed To.b over the top and because I knew it would go yellow on the Cirrus I didn’t bother trailing it anywhere except on the Thai Orchid. I think the reduction on this one gave much more intense oil slick colours. I dropped a few dots of Ivory on the top then heavily reduced again getting a bit of a yellow fume line on the Cirrus. These beads don’t do much other than to prove that To.b will produce oil slick lustre on anything dark. I’m a bit surprised that the oil slick appeared on the Effetre Straw Yellow. I’m wondering if I tried with a Vetrofond Pale Transparent green if I would get the same effect? I’ll have to try that out. All in all, To.b isn’t one of my favourites in this garage box and I think it needs a lot more testing to work out exactly how to get it to do that magical green that Thallo is known for (or y’know, maybe it doesn’t do that which is why it is a test colour?? ), but this should give you enough information to have a good crack at it, if the colour has been languishing around in your glass stash. What struck me most about Be.a was that it has a really terribly, exhaustively long striking time before you can reduce it and get it to lustre up. I really can’t emphasise this enough. This glass requires a long hot kiln strike, so it’s one of those that will need to be annealed separate or put with other long striking DH glass in a programmed run. The Be.a rod is a milky sky blue and as it heats up the end hazes into golden yellow leaving a greenish hue to the glass. This greenish tinge can go either way, shorter striking times yield silvery brown tones whilst very long striking times yield the lustre filled blue tones. Protracted heating and cooling whilst creating your bead is good for Be.a and is the only way it will flame strike enough to get a beautiful sea green colour. I found it much easier to get Be.a to flame strike to a sea-green when used over CiM Hades and the only time I got it to lustre was on Hades as well. 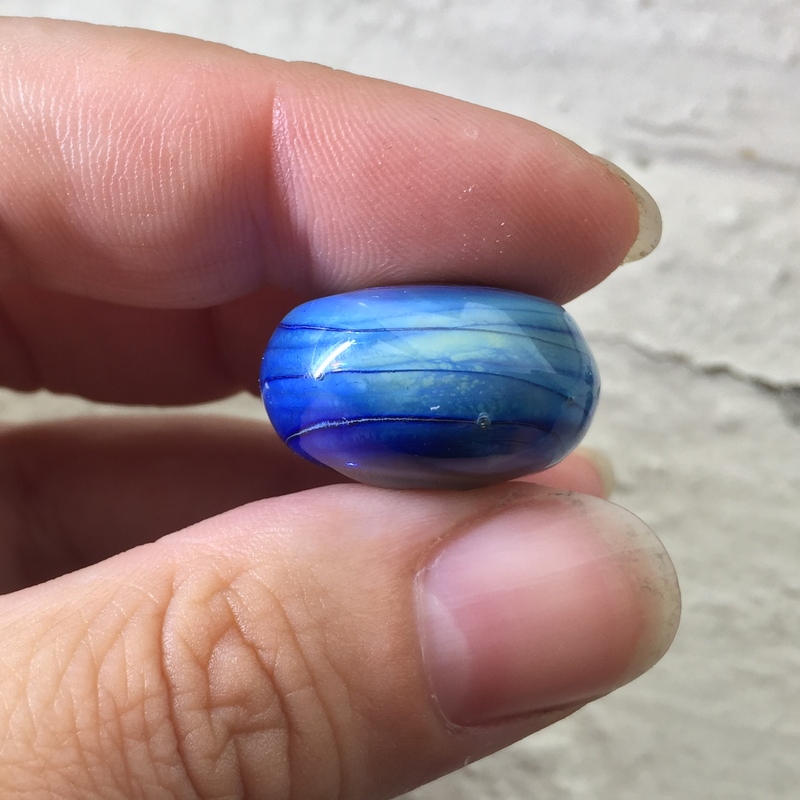 I chose to work on two large beads to test Be.a out, each bead took me roughly forty minutes to complete and most of that time was spent in repeatedly cooling and heating the bead as I was shaping it. All of these photos are of beads that have not been put through the annealer. I will update the photos if I notice any kiln strike, but all the previous tests I’ve done tell me that I don’t get a lot of striking from my kiln. This huge bead had a really long working time, with a lot of heating and cooling using a stamp. Which is probably why Be.a developed some lovely colours. I placed tiny dots of Melia around the edge of the Be.a decoration, which fumed CiM Hades a lovely metallic oil slick colour. When I shortened the strike time down I was not able to get Be.a to strike to those beautiful sea-green colours and I couldn’t get it to lustre up either. The colours were more muted and reminded me of a seaweed green colour with murky brown streaks. This colour does not look very different to how Sk2.a colours up when overstruck on silver leaf. This seaweed green colour also appeared when I used Vetrofond Black and on top of Effetre Clear and when reduced did not create the lustre effect. Whilst I didn’t work these beads for as long as the Hades beads, they did go through the same heating and cooling process. From this I gather that either I need to work the beads rolling in the heat for a much longer period of time or that the best combo for Be.a is on CiM Hades. I find that last point to be a tad unbelievable. I’m more inclined to think that Be.a just responds really well to long working times and repeated flame striking. The back of the same bead highlighting the greenish blue of Be.a after it has been struck and reduced and dotted with Effetre clear and Melia here and there. What I did notice is that for Be.a to lustre the surface of the glass must change. In the two beads that I did achieve a lustre effect I noticed that silver “bubbles” rose to the surface and started to spread. Bubbles is not the best description as there is no air trapped in those bubbles, but I did notice spheres of silver rise through the glass and appear on the surface, if you look really closely at the bead to the right you will see tiny pin pricks of lustre, those are the “bubbles” I’m talking about. The more of those silver “bubbles” appear the more likely Be.a will lustre up. I did encase Be.a but I had mixed results, small dots of Clear placed on a struck and reduced section of Be.a yielded a soft pale green, which was the same for a full encasement of Effetre Clear. Although encasing with Lauscha Clear yielded a murky green and brown. I’d definitely stick to encasing in Effetre Clear or better yet Double Helix Zephyr. Edit: December 2016, after doing a lot of different work with several different slow striking colours this year (and getting a new kiln) it seems more to me that Be.a would be best worked at the beginning of your torch session and left in your kiln to strike over several hours. I think the best thing to do would be to get the Be.a to the silvery brown stage (either encased or not encased) and then pop it in the kiln for a few hours to see if the brown strikes to blue. The picture below emphasises this concept. After Kiln Annealing. There is definite kiln strike on the beads that I had half struck in the flame. So Be.a shows its best with a long garage time. Looking at the beads to your left, these are a bunch of different tests that I did with Be.a. These are the same beads as in the photos at the beginning of the blog, the only difference is, they have been annealed in this photo. Its particularly noticeable with the heart bead, originally there was no dark brown on the bead, but after annealing a spot of brown appeared. What I take from this is that I struck Be.a too much in the flame on that corner, so the annealing process pushed the colour along too much. Looking at the cone bead, one thing I chose to do was layer silver leaf directly over Be.a, burned off some of the silver and reduced and thin linear encased in Effetre clear. Then applied stringer squiggles (CiM Glacier) over the top. I achieved a very organic silver brown effect. It too has had definite kiln strike, most of the silvery part of the effect I got in the flame disappeared after the annealing process. I think this time it’s a case of not burnishing or burning off the silver enough. Although, personally I like this tobacco coloured effect. I haven’t quite got this look before with other “silver brown” glass and I have Kugler Silver Brown and the original ASK version of it (Silver Cinnamon and Silver Rattan). Because I like “organic” brown beads this is a plus for me toward Be.a, but it might not make you enthusiastic. If you do get browns or dirty greens, there is good news to turn that colour around in the flame and then protect that colour in the kiln. I’ve noticed that where I’ve had a brownish green reaction on the bead, dotting clear over the top pulls the brown reaction back to a more sea green colour and this will stay that way in the kiln. What is important about this idea, is that the bead was pretty cold before I dotted a very hot droplet of clear onto the glass, therefore its the really hot glass on the cold brown surface that turns that area moody blue. So if you’ve got brownish muck that you don’t like, linear encase. I’m specifically saying linear encasement because you have to build up a super hot gather on the end of your clear rod and swipe it down the length of a fairly cold bead. This style of encasing should do the trick to turn that brown to blue and it doesn’t seem to be effected by the kiln, in fact more blue pulls through the encased areas. If you look at the little tumble tile beads and compare the before and after kiln firing you can see what I’m getting at. Sadly, I am down to a nub and I can’t test Be.a anymore but this information should give you some idea of how to go forward with using this very interesting slow striking colour. I have put these two colours together as they respond exactly the same way in the flame and work in the same way. Both of these rods have a blue undertone that can be tricked into several other colours using flame chemistry and layering. This glass is very quick and easy to lustre up in the flame. I was so flustered by it at first that I fiddled with my oxy and gas settings because I thought they were not at neutral. Leave your settings as they are because this glass will lustre in a neutral flame. For a hot head user, you might find this glass easier to use without your vents covered in foil. The only difference between Cl/Oda and Cl/Dk.a is the colour you will end up with after you have annealed your beads. The CL Glass is code for Clio. The rod marked Dk.a is actually lighter in colour than the rod marked ODa. However, the colour the Dk.a rod produces on the bead is darker. As you can see from the ends of the rods, Cl/Oda lustres up very easily. Although it is well known that this glass is Clio, I didn’t want to just put it over striking orange and show you that it could go pink. I think testing is about trying things you wouldn’t normally do with an established glass colour. To me, testing is really about pushing the glass in the free time you might have so that when it comes time for production, you can make beads without the hassle of guesswork. So I did a few different things and I ended up with some surprising and pleasing results. “The Blue Beads” The bicone in the middle is Cl/Dk.a over Vetrofond Black and encased in Effetre Clear. 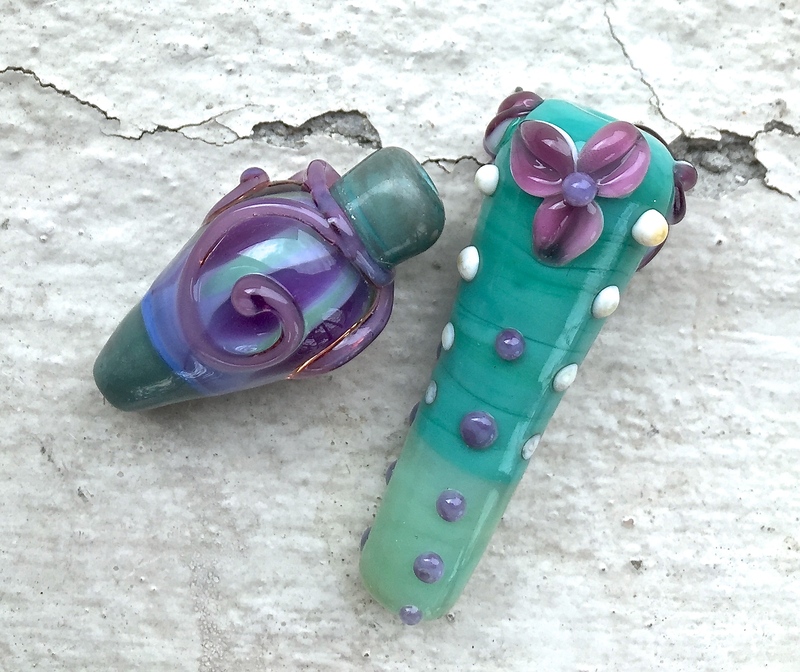 The tube bead is the same glass over CiM Simply Berry and encased in Lauscha. Both beads were made using the same heating and cooling to pull out the striations. They look very different because of the encasing glass (before I encased they looked about the same). The first thing I chose to do was really push how far the glass would go in it’s reactions. What I did was encase the glass without reducing it and superheat to see what would happen. “The Blue Beads” in the picture were made with the two types of Cl glass layered over a base of either Vetrofond Black or CiM Simply Berry. They were encased with either Lauscha or Effetre clear. So it is not surprising to find that heat turns CL glass white and blue. More heat equals more white. Less heat equals more blue. Okay, so what does what? Well CL/Dk.a gave me dark stormy blues on Vetrofond Black and much more royal blue on CiM Simply Berry. Cl/Od.a gave me creamier glacial type colouring on everything. I think Effetre is better to encase with because you don’t get that “fuzzy” characteristic that Lauscha gives. On the tube bead you can see a heavy reduction of Cl/Dk.a on Vetrofond Black gave me a really metallic blue that fumed the Lauscha encasing (visible in the picture when you click on it) turning it slightly yellow at the edges. You can storm this glass easily, but, if you do plan to storm the glass for the blue look, be aware that garaging will push the colour along to the white tones. It was very hot in my studio (about 92F, 33C) when I made the round beads in the picture. I was trying to capture how CL/Dk.a looked on CiM Simply Berry and it took three goes because I had to work extremely cool due to the ambient temperature. This means long garage times will impact the colours when using CL glass for this technique. Cl/Oda mini barrel to the left made on Vetrofond Black and Cl/Dk.a “nightfall” bead to the right. Photographed in natural light only. Now to my favourite part of the testing, again, I didn’t want to write hey look put this glass over striking orange and you’ll get pink. I wanted to really show the variability of it. Unfortunately some of the beads I made shattered because it was so hot in my studio that I lost focus and didn’t flame anneal properly. The beads that survived are these two and I’m glad they did, they really show the clear difference between CL/Dk.a and Cl/Oda. Cl/Oda is the little barrel bead to the left made on a base of Vetrofond Black, it was reduced and cool encased in Effetre Clear. There is a beautiful sea green colour to it and a reflective opalescent blue. You can see that the bead has some “white” feathering where I had to heat that section a bit more to shape the end. Unfortunately it stopped at a small barrel because it was too hot, I didn’t go on to make a “nightfall” bead with this colour. I’ll do one once the weather drops back to something reasonable. “Nightfall” bead front and back, photographed in natural sunlight and LED studio lights. What I’m going to do is explain how I made the “nightfall” bead. It is Cl/Dk.a over a range of base colours and has been encased with Effetre Clear. The idea was to compare Cl/Dk.a and Cl/Oda with the same base colours but beads kept cracking. Effetre Ivory, Vetrofond Striking Orange, CiM Simply Berry, Vetrofond Black, Vetrofond Black (with the moon decoration and some striations and dots of Cl/Dk.a). You can also use transparent purple, ambers and blues, however if you want a graduated look always work lightest to darkest colour and finish with an opaque base colour. Step 2. 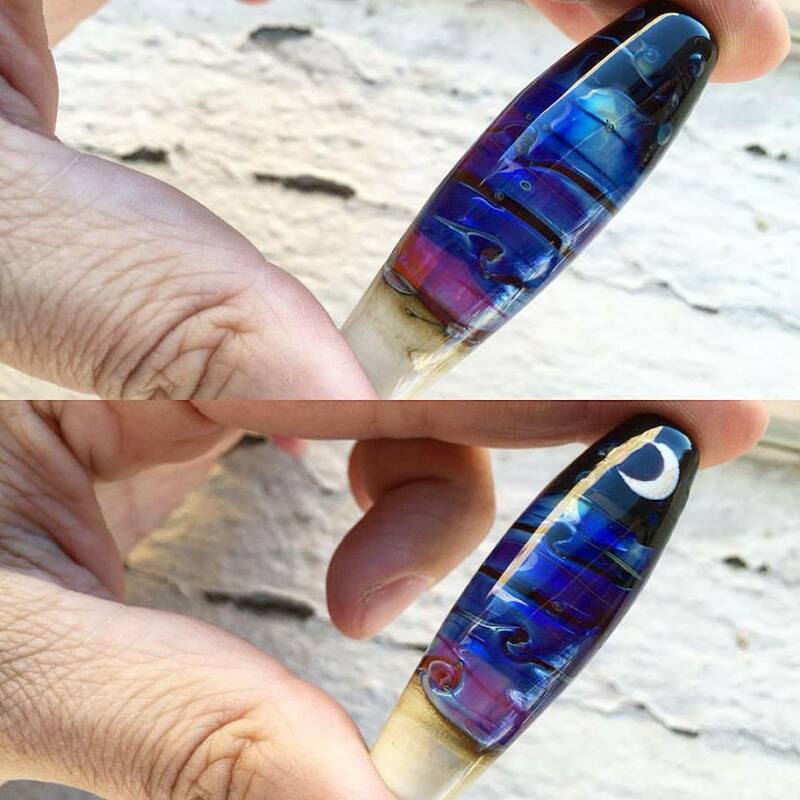 I ignored the Ivory section and layered Cl/Dk.a directly onto the base colours in concentric bands (leaving small gaps here and there) until I reached the second layer of Vetrofond Black with the moon decoration. (I did not encase the base layers in clear, but you can if you want to get a lighter finished colour on your bead). Now this is the important part, to get the super opalescent lustre underneath the encasement you need to work cool. 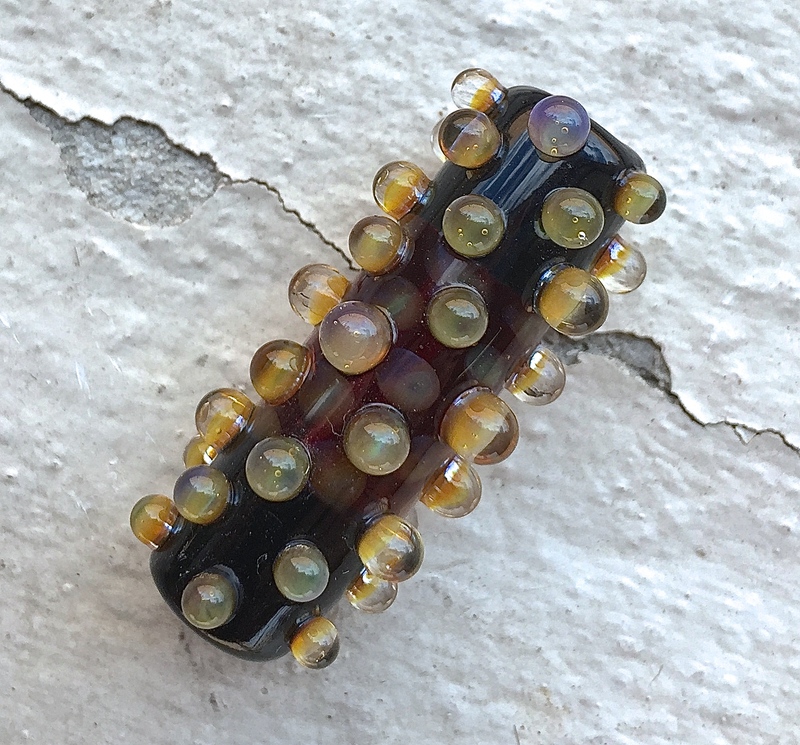 I spot heated small sections and twisted with a Simply Berry Stringer, I did this because as you recall heating the Cl glass lightens it and I wanted some variation in my bead in addition to the variation that the different base colours would give me. After spot heating and twisting I took the bead out of the flame and let it cool a little. I wanted the surface of the bead to be as cold as I could get it, without the bead cracking. Then I reduced the bead by putting it at the outer edge of the flame (as if I were flame annealing it). I let it cool, inspected the reduction, then gently wafted it a slightly heavier reduction flame again to get a super reflective surface. I let the bead cool again slightly, then cool encased in Effetre Clear. What this means is, I very slowly wrapped Effetre clear around the bead and smoothed the encasing out without getting the bead to glow. Pop into the kiln or flame anneal for preparation into vermiculite. I know the bead doesn’t look like it’s encased, but it is. You can leave the lustre without encasing it, but I like the more subtle effect from encasing. These Cl colours give probably the best lustre/opalescent look I’ve been able to keep in all of the garage box glass so far under encasing. The bead looks amazing when held up to the light and I’m not tooting my own horn, those transparent layers reflect a lot and the bead changes under different lighting arrangements. It really is a pretty cool effect, so thank Double Helix and beg them to make more. I think it’s very obvious that you can use Cl/Dk.a to get that mystical wispy hot pink effect that Clio is known for, you can see hints of this at the base of the Nightfall bead. The Cl glass is predominantly blue based but can be worked to purple and pink depending on what is used underneath. It’s hard to tell in the photo but CiM Simply Berry is a good base for this glass as well because you’ll pull more silvery, blueish purple from it, which is a nice change from always getting hot pink. The spiral bead is Cl/Oda spiral wrap reduced and encased in Effetre Clear. Its layered over a section of Cl/Oda that has been covered in Effetre clear as well. I keep thinking that it looks just like Dichroic glass. Photographed in natural sunlight. In this photo you can see the difference between Cl/Dk.a in the nightfall bead and Cl/Oda in that spiral bead. You’re going to get more hot pinks, golden salmon tones and bright purples from Cl/Oda, particularly when it is used over a light transparent base. Cl/Dk.a over a transparent base lends itself to more blue toned colours. To explain the spiral bead, read the caption to the photograph. For now, I’m just going to admire the hell out of this bead because its the best pink pop I’ve seen without even trying to get pink!! So for those of you that struggle to get pink out of regular Clio if you have some Cl/Oda; you can get pink easily. Interestingly, what I discovered is that if you reduce and encase the Cl glass it does not strike further along unless you really blast it with heat. I mean really blast it. I had to flame anneal the “nightfall” bead for quite some time as it is pushing 4in long by 1/2in thick and the colour didn’t change. So, I’m pretty sure that the colour you develop in the flame will stay if you have to garage your bead for a while. Of course you’ll have to test this out with your kiln, but I’m fairly certain you will not lose the encased opalescent effect if you have to garage for a while. A very pretty shard bubble of Cl/Oda and Vetrofond Pale Transparent Green. Photographed in natural sunlight only. Which brings me to my last hint with the Cl Glass, make shards with it. Particularly with Cl/Oda. I used a base of Vetrofond Pale Transparent Green and smeared and dotted Cl/Oda over it and as you can see, I got a very pretty and very reflective salmon gold toned effect when I reduced the shard. I made a shard with Effetre clear and Cl/Oda hoping I’d get that pink, but I didn’t. It was reflective gold. I really like the Vetrofond PTG base the best. I’m not an expert at shard blowing by any means and I was able to get something wonderful out of it. So those of you that are amazing at making shards, I hope you go to town with it. 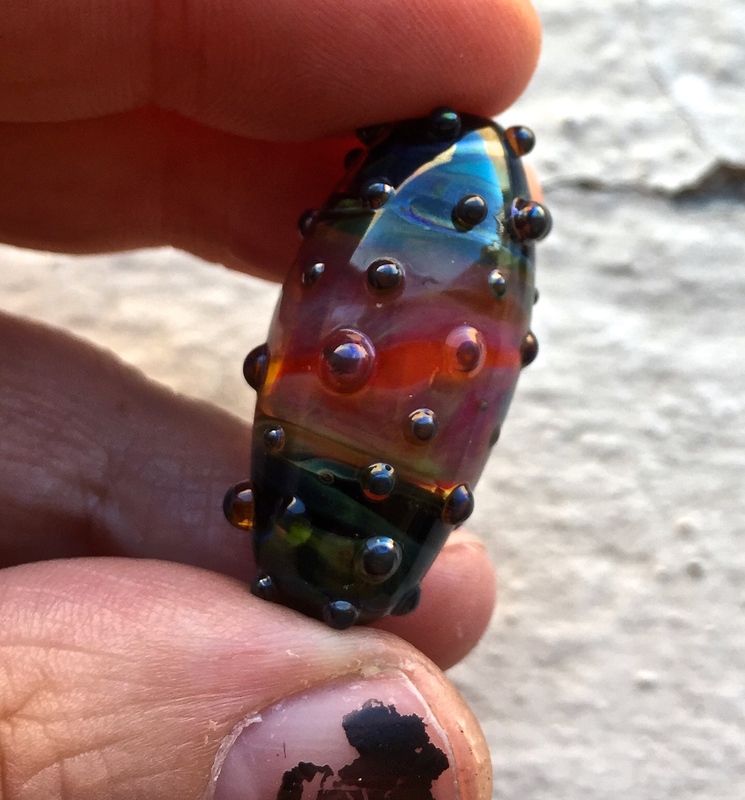 I did make a bead with the shard but as luck would have it I forgot that you can’t encase CiM Canyon De Chelly and I got an incompatibility crack through the half of the bead that is encased, booger. But, for your viewing pleasure here is the cracked bead I made with some really tiny pieces of shard. 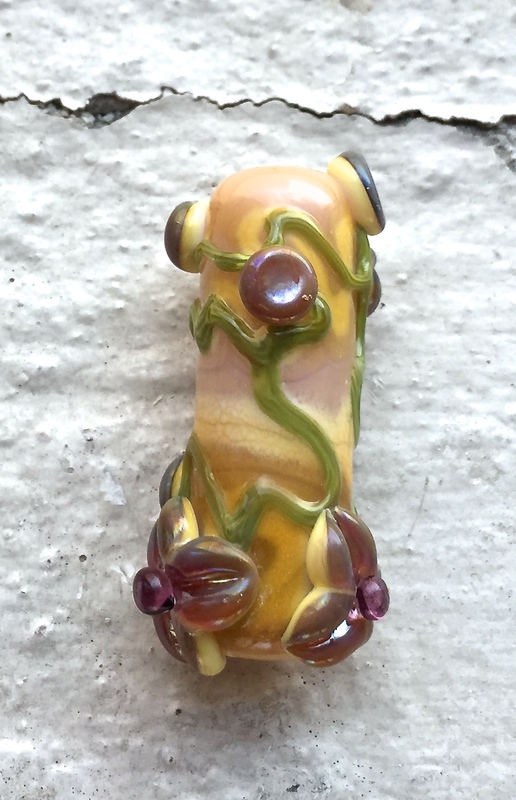 Oops, forgot CiM Canyon De Chelly hates encasement, but here’s an “organic” style bead with some of the shard on it. The shard pieces were extremely heavily reduced and holy moly they look just amazing (in my opinion). I can’t wait to practice my shard making more so I can make bigger and thinner shard pieces to wrap completely around my beads. The best thing about this shard is even the sections that just had a tiny bit of Cl/Oda when hit with a reduction flame properly the Cl/Oda fumed the whole shard and it lustred up. I’m really happy with how this shard turned out and apart from the crack, I really like the bead. I’ll probably make it again and obviously NOT encase Canyon De Chelly. I would love you to share your shard bead pictures with me, because I’m a complete novice with the technique and would love to see what an expert can do. Feel free to drop me a line and direct me to your auctions, web page or facebook profile. The black core beads are Sk2.a encased with Effetre Clear over CiM Hades. Not much of an effect. The gold toned beads are Sk2.a over Vetrofond Med Topaz and encased in Lauscha Clear. The crappy lentil bead is ASK104 Mystic Grey under Sk2.a and encased in Effetre Clear. I’m putting it out there, right up front: I hate this glass. Okay, not really anymore but I felt that way during the testing phase at first. Everything I was doing with Sk2.a turned to bleh. The photo to the right shows the first testing that I did and I wasn’t happy with the results at all, so I knew I was going to be testing it further but I was down to half a rod and hadn’t worked out how to get an intense blue colour. Apparently that is what Sk2.a can do, give you intense blue. Yes, look across to that picture and despair. No intense blue to speak of. For these tests the most I’ve achieved is a pissweak wishy washy blue, the blue green big lentil in the photo is what Sk2.a does over ASK104 Mystic Grey. For the test beads below I changed it up and used Effetre Black instead of Hades and that did make a difference. Sk2.a is a cream coloured glass in the rod and the glass will pretty much stay that way if you cannot strike it in the flame. Here is a link to the talented work of Kathleen Ritsuko Hosterman, who has managed more than me with Sk2.a on its own. So far the vibe I get from Sk2.a is to hurl it away from me in disgust. You might like it more though or have a lot more success. Sk2.a beads photographed under studio lights. Top bead, Sk2.a over Vetrofond Black and I couldn’t get any reaction. Middle and Bottom bead Sk2.a and silver leaf using various heating and silver leaf applications. I was really fed up with Sk2.a but I decided to tackle it again using Vetrofond Black as my base instead of Hades. I still didn’t have much luck at all (see the top vessel bead in this picture to the right), until I had a brainwave. What if Sk2.a is a booster for other DH glass? Or could be given a boost by using silver leaf? I tested the silver leaf theory out and hit the jackpot, I could get the blue out of the glass without having to strike the glass in the kiln. You will have to change your kiln settings to strike Sk2.a, increasing the heat and the hold time so that you can strike the glass. This means that you will definitely have to run any beads made with Sk2.a in your kiln on their own. My way around this is to use the silver leaf to “cheat” a reaction out of the glass to avoid the long kiln strike. The reaction of Sk2.a on silver leaf is varied depending on how you applied the silver to your base bead, what clear glass is used to encase with and how much heat is applied to the bead. The photograph to the left skews the colour in the beads. Sk2.a is colour shifting under different types of light. The blue is actually much more purple but L.E.D lighting shifts the glass to look blue. This photograph also shows you how the beads look after they’ve been taken out of vermiculite, without being through the kiln. So all of this colour was developed in the flame. I don’t know if they’ll strike more, it is possible that excess silver under the encasing may burn off and change the colour, or they may not change at all. Update: After taking all the photos in different light; personally, I think the colours struck just a tiny bit more, but it’s hard to tell from the photographs. The information on how to use leaf with Sk2.a isn’t straight forward because this is not a step by step tutorial. That would take a lot of time to write and photograph. Instead I’ve listed down the catalysts for making the beads you see above. This mini tutorial below is photographed in natural daylight. As you can see, bright daylight as well as halogen studio lights causes another colour shift in Sk2.a leaving it looking far more steel grey. I actually really like how Sk2.a shifts in different types of light, I have no idea if this is because of the silver leaf underneath or not as I’ve never been able to successfully kiln strike this glass. This mini tutorial helps explain the instructions for Sk2.a on silver glass below. Click this instruction sheet to open to a larger downloadable version. Bear in mind, these are test beads so they’re not a true indication of what Sk2.a can do when one technique is used. Natural sunlight photography makes Sk2.a look drastically different compared to L.E.D light. I found this technique worked best with silver leaf. I don’t use foil much in my work but I have thick leaf and when doubled looks like foil. If the leaf is too thick it doesn’t burn off enough to get the blue and purple tones from Sk2.a. So, along with using the right type of black glass, you want to stick with leaf for the purple and blue tones. This is because you will be burning off a little bit of the leaf, before reducing the leaf, applying a thin layer of Sk2.a and striking the glass to blue. However, if you want the gold reflective metal look and to be able to see the metal inclusion use foil or doubled-up leaf directly on transparent glass without burning it off. You will have to reduce the leaf before layering Sk2.a over it. However, bear in mind that using a thicker application of leaf, it is possible that you will instead get a gold reaction or yellow/orange fume line under the encasement and not gold mirroring if you do not cover the leaf completely with a thin layer of Sk2.a. If I wanted the silver leaf to remain largely in tact for the reflective gold look, I worked everything extremely cool and lightly burnished in the leaf to avoid any fuming. Then I reduced the silver leaf, then dotted a tiny amount of Sk2.a over the leaf and then smooshed it flat with a brass paddle to cover the leaf with the thinnest layer of Sk2.a, lastly I let it cool, return to heat to strike the Sk2.a, cool lightly and then encase with Effetre Clear. 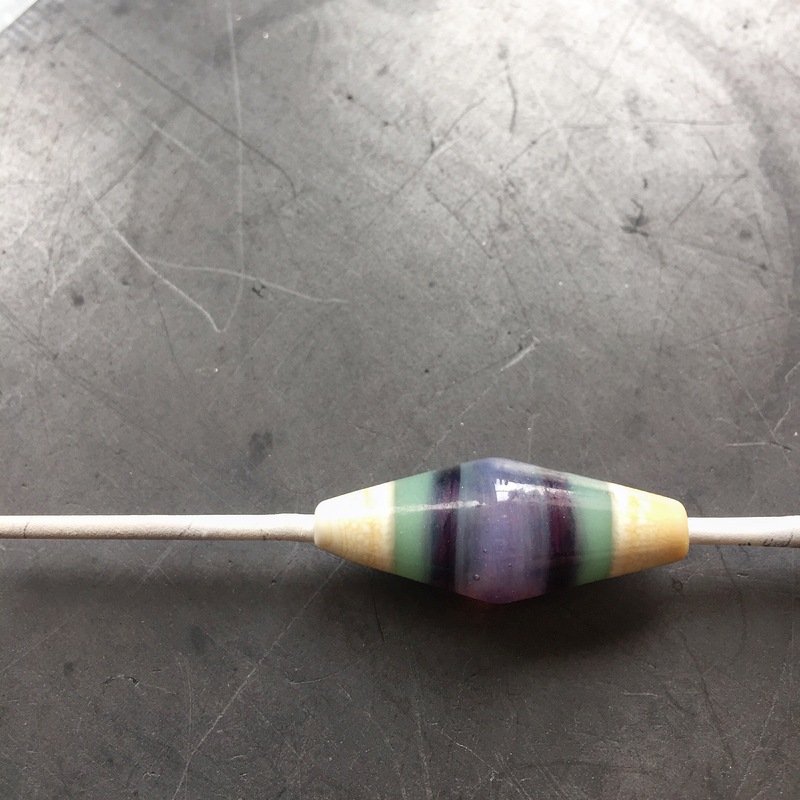 Sometimes this reaction will go a pale lilac colour (on black) and sometimes it will go bright gold (on light transparent glass) it depends on how long you struck this section of the bead for before encasing. A big dot of Sk2.a over leaf on a black base will give you a very vibrant blue if very slowly melted in, and spread evenly across the leaf. Same bead as the photo above, but the fluorescent light is on overhead and now the Sk2.a parts looks more purple toned. I burnished my silver for some spots on the beads and for others I didn’t. In places I did not burn off the silver and in others I did. This will be the step that requires the most practice and trial and error. Its better to burnish your leaf in first before encasing in Sk2.a, otherwise it goes brownish gross, particularly if you want to get the blue and purple colours. You can see brownish patches in sections in the photo tutorial above. Its more likely to happen on dark glass. I found burnishing in and then gently burning off the silver, whilst holding the Sk2.a rod above my bead warming (to catch the silver fumes) worked very well for getting a beautiful bright purple-blue colour. I also found that if I did not burn off the silver a little (and I missed a spot when covering it with Sk2.a) the whole area would turn pale butter coloured and the encasing would be effected as well with a yellow tinge. This is one of those techniques that require cooling between each step to get the richest colours. Whether it is for the blue purple effect or for the gold effect. To get the richest blues and purples you need to work cool. To get that metallic gold look to the leaf without the encasing fuming and the silver burning off completely, you need to work cool. Heat, or working the bead too warm will push your reactions to paler colour variations or burn off your silver too much. Admittedly, this is pretty handy to know in a bead, but you want to be able to control the reactions. So work cool and only work warm where you deliberately want paler colours. I happen to like encasing and a lot of the magic happens when you do encase. Although you can achieve the effects without encasing at all. I found that I was more likely to get blues and purples if I encased with Lauscha and I was more likely to retain any metallic reflective effects if I encased in Effetre. On all of these beads there is a mixture of clear encasing. The colour changes you see in the beads primarily occurred because of heat and the fact that I was testing the difference between CiM Hades, Vetrofond and Effetre Black. Sk2.a is more likely to go yellow on Hades, but encasing Sk2.a hot will also transition it to yellow and then to dirty greeny brown no matter what is used underneath. 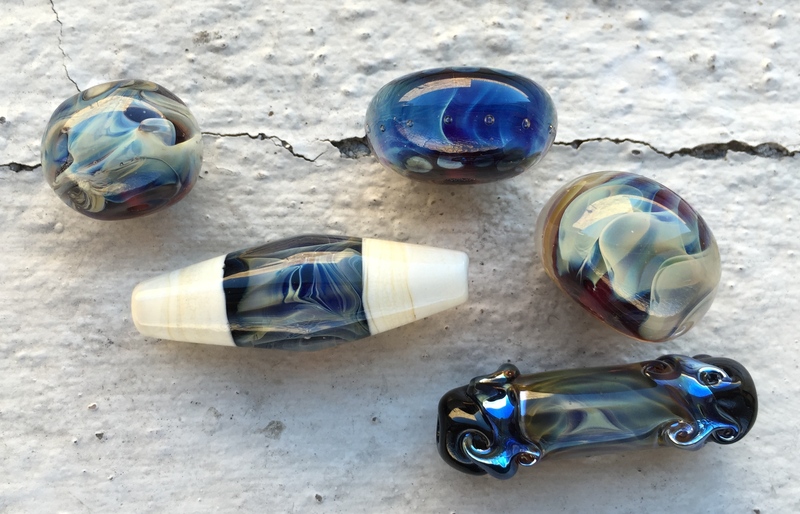 In one of the beads you can see a touch of storming effect (paler blue stripes) through some dark blueish glass. 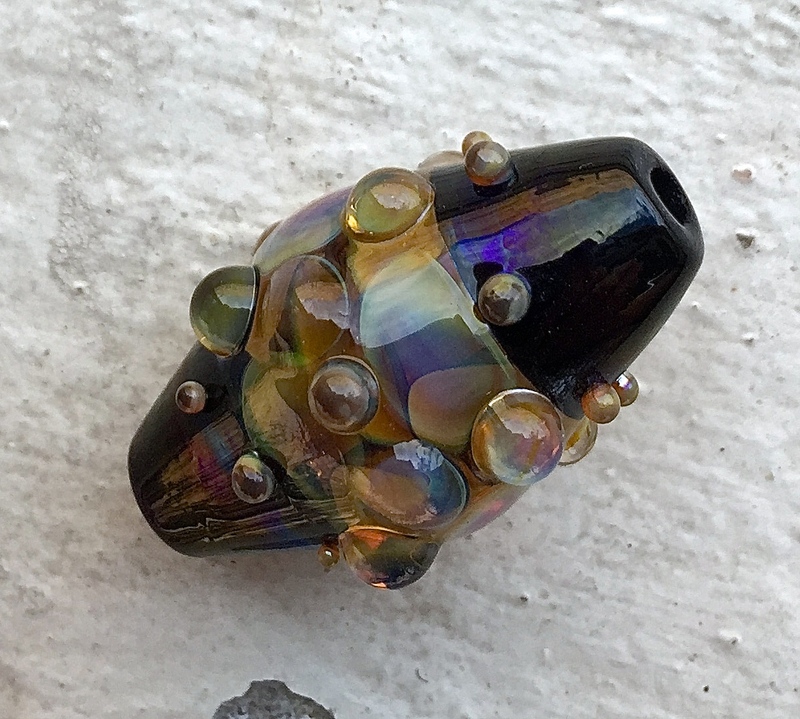 This happened in a section of the bead that had a thick layer of burnished (and burned in) leaf that had not been reduced and an application of very hot Sk2.a under a cool thick Effetre Clear encasement. Hot Sk2.a (almost white hot) smeared over leaf produces really interesting effects. I did this by accident and didn’t experiment further, although it has great potential for creating “lightening” as the Sk2.a really develops these white and pale blue jagged bands in a really deep purplish blue background. The challenge of this glass forced me to really think about how to use it. I know there is a bunch of other “sk” coded glass. I am not sure how the other Sk glasses will go with the “silver leaf” technique. There is a photo of my Sk rod in one of the photos above, if your rod looks like this but you’re not getting any reaction out of it, my “expert” Aussie advice is to chuck it over some silver leaf. Oo.a melts smoothly and easily and reduces very quickly! Its a beautiful super lustre. Oo.a is a beautiful pine green colour in the rod. My rod has white inclusion chunks (you can see them at the end of this rod in the picture). Its likely that your rods have inclusions in them as well. I plucked them out of the rod so they didn’t end up in my beads as I wasn’t sure if it was furnace grit or silver chunks. This rod was a pleasure to work with, no random breaking or pinging in the flame. Oo.a is a very smooth and easy to melt glass, it stays a dark teal green until you’re ready to reduce. It reduced easily for a really pretty metallic rainbow effect. The more heat in the reduction stage, the bigger the colour range. I tried to encase that reduction effect but that doesn’t really work with this glass. So, if you like that metallic lustre look you’ve got to keep it on the surface of the bead only. Edit: December 2016 Unfortunately you cannot trap that lustre effect under encasement or get an opalescent look from this glass. Its a reduction super lustre and that’s all it wants to be. After experimenting greatly with this glass over the year I can attest that surface decoration only is the best use of this particular colour, unless you’re going for organic effects under encasement. Left bead with the Ivory striping and encased Oo.a over CiM Hades and ASK104 Mystic Grey. Right Bead was layers of Oo.a over Mystic Grey mostly, with tiny parts over Hades showing through. Lets go back to what I was doing with the testing, I’m not really sure what was going on with my brain last year when I tested this colour (it was hot weather, lets blame that). I randomly decided that since I didn’t like the reaction I was getting over Hades (a Triton type deep blue effect) that I would just layer Oo.a over whatever came to hand. Well… that sure was interesting. Firstly, let me explain what happens with this colour over Hades. It goes blue, not even a really exciting bright blue, its just opaque blue, even less exciting than Triton. So I’m not going to focus on that for this section of the blog and because I wasn’t impressed with what I got I didn’t take any photos of the beads before giving them to my niece and nephew. So, If you want the blue reaction, layer Oo.a over black (dark opaque glass), light reduce, then cool encase for a Tritonesque style blue reaction. Don’t encase if you want metallic blueish, greenish, greyish colours. You can see this effect at the bottom of the left hand bead just above the raised dot section. The lustre Oo.a produces is extremely reflective, even if you don’t like these dark colours it’s still pretty spectacular. Edit: December 2016 I realised much later that the darker range of lustre colours is affected by the base colour and how much heat you gave Oo.a when reducing. I tend to reduce my beads quite far out and under the flame, but if you put Oo.a directly into the flame those initial dark lustre tones do lighten up quickly to lighter greens and blues. Oo.a reacted with the same bluish opaque tones when used over anything dark really, including CiM Simply Berry, but it will lighten up considerably with a heavy handed reduction, particularly if there is a transparent or lighter coloured base. If you want to know how I got the funky organic stuff in the photos above keep reading. If you want to see a photo of these lighter lustre colours scroll down to the end. So, because I was in a mood and clearly heat affected by the hot summer sun. I pulled out a rod of ASK104 Mystic Grey (yes, original ASK from 2007). I layered Oo.a over the top of the ASK Mystic Grey and got a really pretty goldish-salmonish (very technical terms) reduction lustre (see the very top of the mostly green tapered bead in the photo above, right hand side bead). Then I decided that I would try and encase the lustre. So I used Effetre Clear and it turned well, very organic green. Motto of that story, light opaque grey colours turn Oo.a goldish salmonish, don’t encase it and your bead will look beautiful. Encase at your own peril. Since I’d made a hash of the bead I thought I’d destroy it some more. 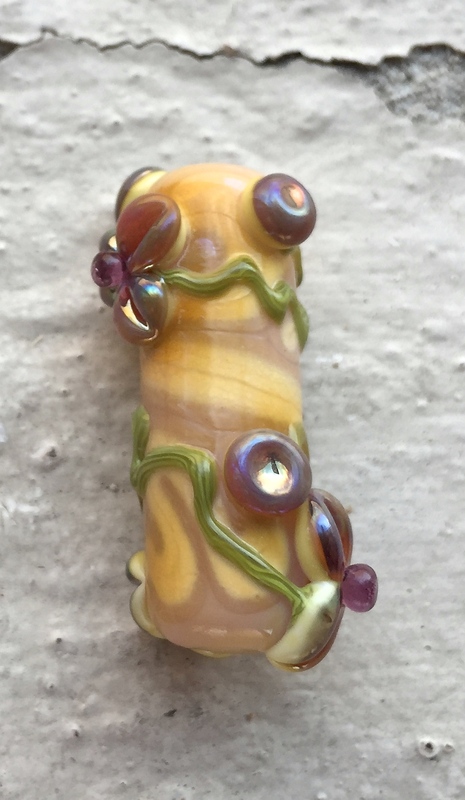 So I tested with heat and I found that the hotter Oo.a got under the encasement the more yellow tones pulled through the green, until I ended up with a very organic looking mostly green bead. I dotted a few more dots and reduced and as you can see the dots have that sort of gold, leaning to pink lustre I was talking about in the paragraph above. Much the same effect is going on in the lefthand bead except there is a layer of reduced Oo.a over clear glass which has produced a much more intense lustre effect that throws emerald green tints in the light, some fuming of the Effetre Ivory took place as well (which I like). An interesting organic reaction between Effetre Dark Ivory, Double Helix Oo.a and Lauscha Clear. Not really what I’m looking for in a DH glass, but I’m sure it has its uses. I thought, what the hell, lets try more organic stuff. I did something uncharacteristic and picked up a rod of Ivory and my Lauscha clear wondering if I would get a reaction between Lauscha and Oo.a like I did between Lauscha clear and Cx.a. 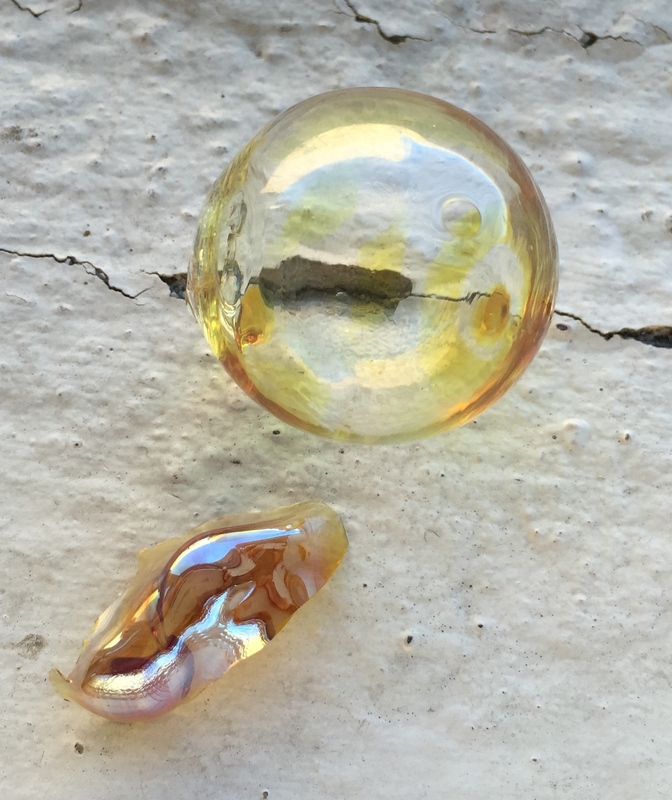 Yep, same reaction but more intense, there is a distinct fumed yellow brown reaction line and as you can see this bead to the right the “clear” encasement actually looks really grey, not a nice effect, but it works for this particular bead. Oo.a over Ivory is very organic and wants to web out and do some funky reactive stuff. I encased in Lauscha clear, then I trailed Oo.a over this encasement and then encased with white hot Effetre clear over the top (no reduction) and whilst it’s hard to see in this bead, I got a purple-blue splotch of colour. So, Oo.a will turn a pinky purple to pale blue when sandwiched between layers of clear, where no reduction has taken place and the encasing glass is white hot and drippy. Several Oo.a layers over a CiM Hades base tube bead. Terribly shaped because brain obviously not switched on. Which brings me to the last test I did over a base of CiM Hades. I did two layers of encasing, lots of even heating and marvering and a reduction layer. This bead to the right shows all of those things. I’ll take you through this bead in sequence. The base is a tube of CiM Hades over which is a thick splotch of Oo.a, which was reduced to a pretty metallic sheen. Then, because clearly I was in a mood I thought, thats not good enough. Encase all the things! So I encased it in Effetre clear. Then I got to thinking, alright lets really heat that encased layer to see what would happen. Everything under the encasement turned bright yellow, anything not encased went gross. So Effetre Clear encasement turns Oo.a yellow when super heated and Lauscha Clear encasement turns Oo.a green when super heated. There’s your baseline for what to encase with if you’re trying for more sandy yellows, pinks and apricot tones use Effetre Clear. If you want moody greens, sea greens and blues use Lauscha clear. In order to hide the gross sections, I encased them then I swirled more Oo.a over the bead, reduced lightly and encased again in Effetre clear careful not to overheat the bead. I wasn’t really cooling the bead down but nothing was white hot either, so I would say the second layer was worked warm. I then encased this second layer. Looking at the lower half of this bead you can see how Oo.a looks when reduced and sandwiched between two layers of Effetre clear. I like the transitioning translucent green to sea green colouration in this bead. Interestingly, this was the ONLY layer to kiln strike a bit more. None of the other beads did, none of the other layers did. It could be where I placed the bead in the kiln. The top bead: is Oo.a reduced heavily in the centre and more lightly outward over CiM Simply Berry. This is the effect I was talking about earlier in the blog piece, you can see how the lustre transitions from blues and greens to yellow then finally to pinks and apricots with the application of more heat in the reduction step. I trailed dots over the top of this bead with Cl/Oda. The bottom bead: is Cl/Oda over CiM Simply Berry. Beautiful reduction lustre effects from both. Whilst they look similar the patterns they leave on the surface of the glass after reducing looks different. Oo.a tends to striate whereas Cl/Oda blooms and creates blotches. The last thing I did was to wrap a spiral of Oo.a over the top end of the bead and reduced heavily. I forgot to smooth out the tube before adding this last wrap, when I reheated to smooth it all out I lost the original reduction. So I panicked and reduced it again. The second reduction (which is what you’re seeing on the bead) is darker and “muddier”. So it is possible to re-reduce after returning this glass into a neutral flame, but it won’t look as nice. I cursed myself for being silly and not marvering the bead smooth before the second reduction. So, I have a badly shaped bead. Oh well. Garaging an encased layer of Oo.a will probably not transition it to yellow (to get yellow you really need to blast it with heat). However, a long hot garage time will turn layers sandwiched between clear more opaque pale sea green rather than blue-green translucent. I would make this style of bead last to preserve the translucent look as it is more appealing than opaque sea green. Cx.a rod, showing a trace of purple lustre on the end of it. This glass melted smoothly and was not shocky at all. This was one of those rods that I didn’t really know what I was going to get. I had narrowed it down to being some sort of superlustre or possible Hyperion variant. Its not a Hyperion variant, the colours it produces are very different and it can react like a superlustre but it’s not exactly that either. I really can’t describe this reduction glass, it doesn’t seem to do what I think its going to do and each time I try to replicate something I get a different reaction! Excuse those horrible fingernails. This is the Paua Shell look I am so excited about. Gorgeous isn’t it? 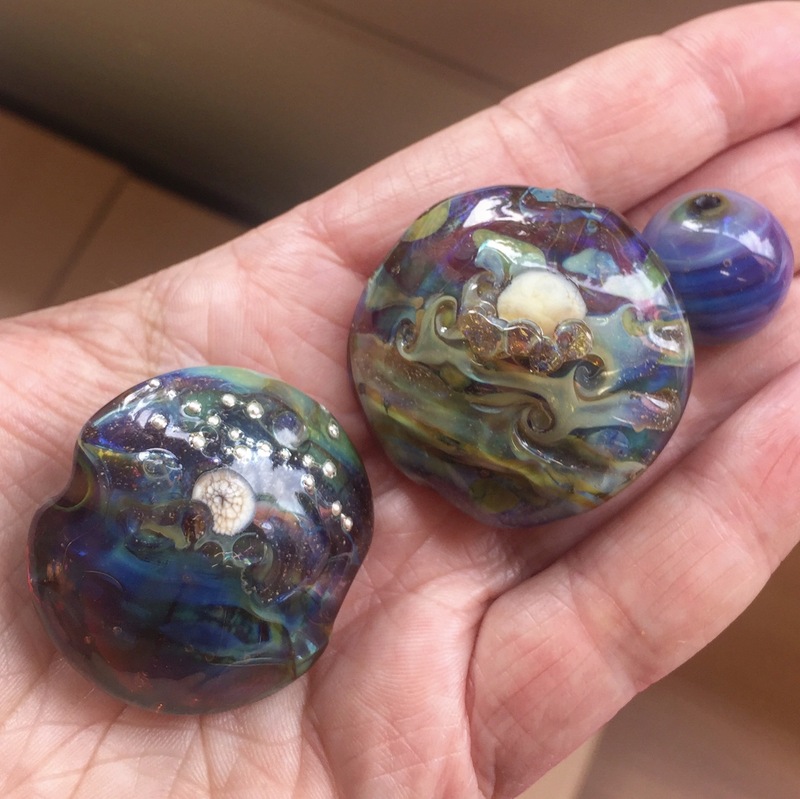 The very first test I did was to make a little round spacer bead on Hades, lightly reduced which I encased with Effetre Clear to see what sort of glass I was working with. And it is glorious! I got a purple Paua shell reaction which shifted to olive green that reflects electric blue metallic lustres. Oh wow! Wow! WOW! I was rapt, now here was a glass I could easily fall in love with. Then, try as I could… I could NOT replicate that effect when encased again (probably a good idea, I only have one rod and I would have sold a kidney for another half pound of it). 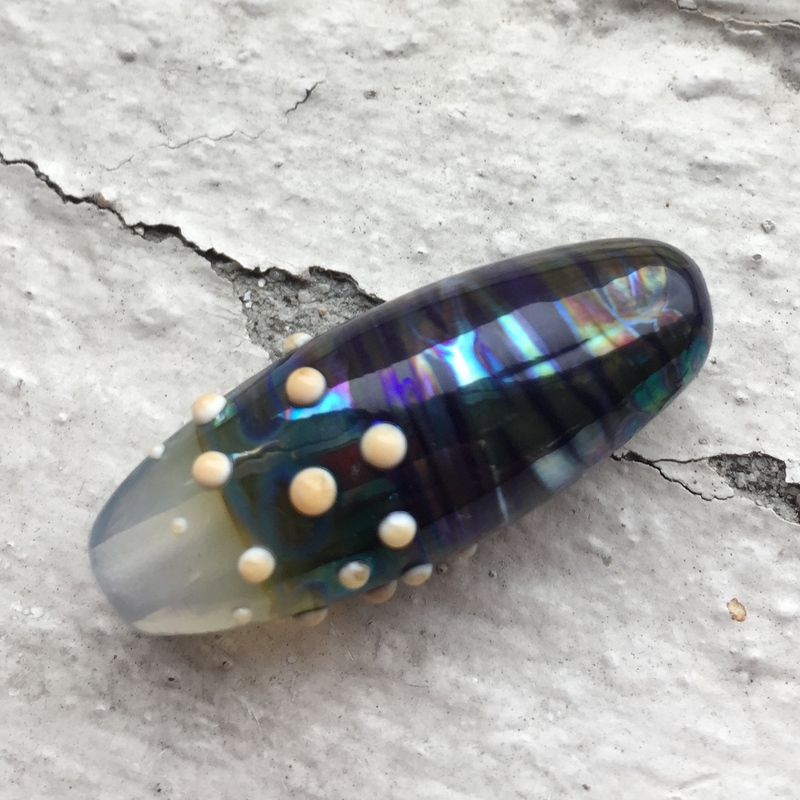 I have an idea of how I achieved this Paua shell look, but for whatever reason my glass-fu was off and I wasn’t able to achieve that exact effect again. Cx.a is a reduction glass, and it likes to be cold. That means your base bead has to be cold when layering Cx.a over the top. The whole bead has to be cold before reducing, it should be really cold before you encase and you should not apply white hot encasing glass. Cold… geddit? 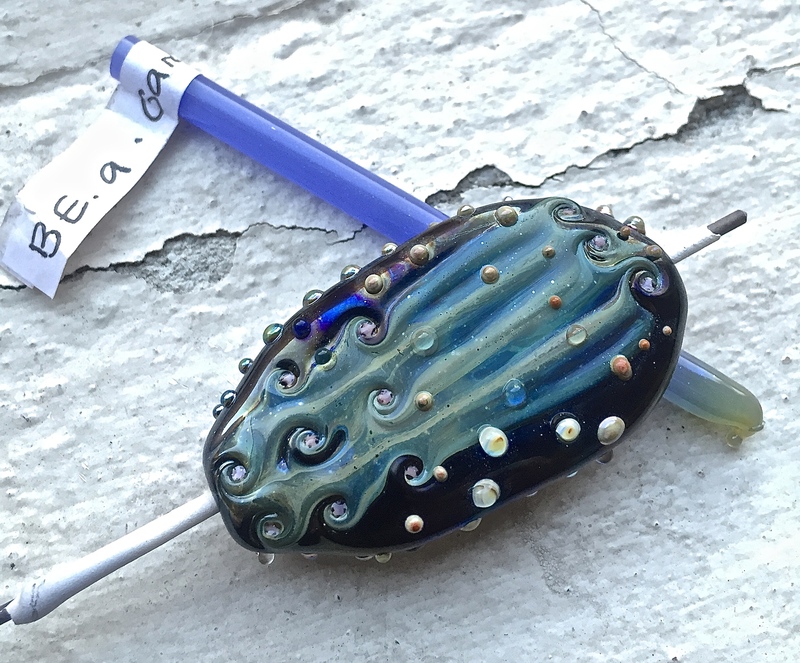 Cross your eyes, bite your tongue and don’t breathe if you want that Paua shell look, because for the life of me, I could not replicate it in a larger bead and I cracked plenty trying to do so. One of the rare photos taken under my studio lighting instead of natural daylight. This photo demonstrates the changeability of Cx.a glass from one rod. Cx.a falls into two broad colour reaction categories when encased. It effects blue, purple and green mix (with or without lustre) when used on dark transparents and CiM Hades (probably all blacks). Then there is the jelly opal effect (some lustre, some colour shifting, some ghosting, just like jelly opal) which occurs on pale transparents and clear glass. 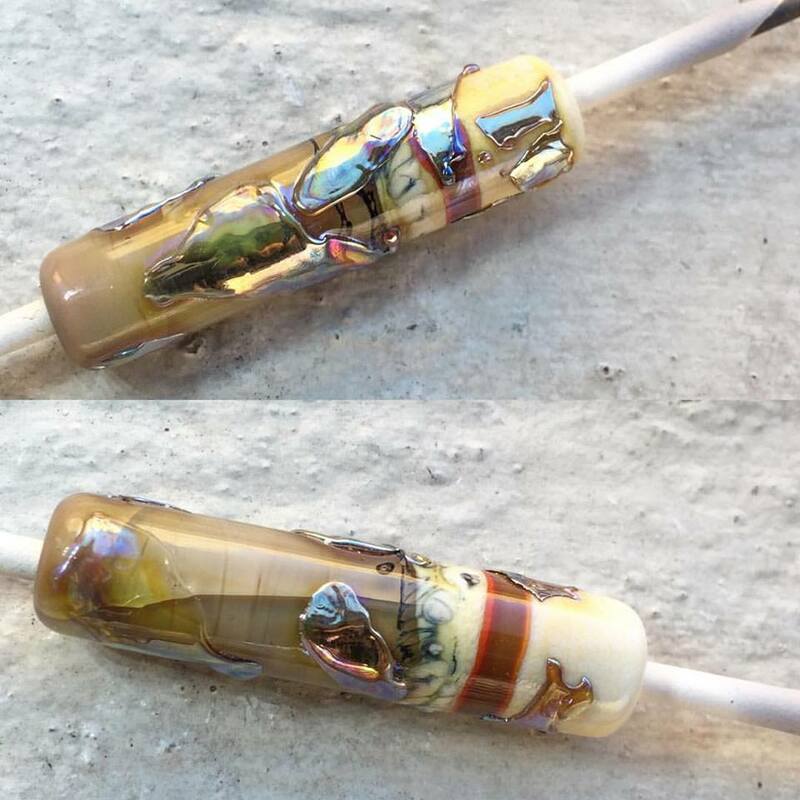 Whilst this is a reduction glass, reduction on the surface of the bead did not produce a lustre, instead I got a dull metallic gold look which fumed anything not encased in the flame (doesn’t appear to have fumed anything in the kiln). This glass looks better encased from what I see in my tests. Jelly opal effect with the added bonus of dots that were not encased gently fuming Hades to produce an oil slick surface. The jelly opal effect occurs when Cx.a is layered over a pale transparent or clear glass, then reduced and encased again. I tested this out in a few different ways on this bead to the right after noticing it when encasing dots on another bead. What you can’t see in the picture is the core of this bead, it is Vetrofond Medium Topaz Transparent. There is a layer of Cx.a dots melted in on this core of Topaz, I gave it a light reduce and then encased in Effetre Clear. I got a really nice greenish purple jelly opal look on these dots. I then did another layer of dots on the Effetre Clear, melted flat, light reduce and encased. This layer of dots went pale coral to yellow with a dark outer ring where the glass reacted with the clear. Okay, not as pretty as the first layer but still cool. The bead was shaped into a bicone using a graphite marver. The dot bead that kicked off the testing for the bead above. The centre core of this bead is CiM Simply Berry, nothing special to see here. Then I did a row of dots on the clear surface, melted flat, reduced and then topped off with a raised dot of Effetre clear. This layer gave me the jelly opal droplets, whichever way you turn the bead, the colour shifts in the dot. Very pretty, some of them even have a bit of lustre and some have hazing. The lustre ones were properly cold before reducing and the hazing ones were slightly warmer. Finally, I did tiny dots of Cx.a on the surface of both the Hades caps and the clear and heavily reduced. 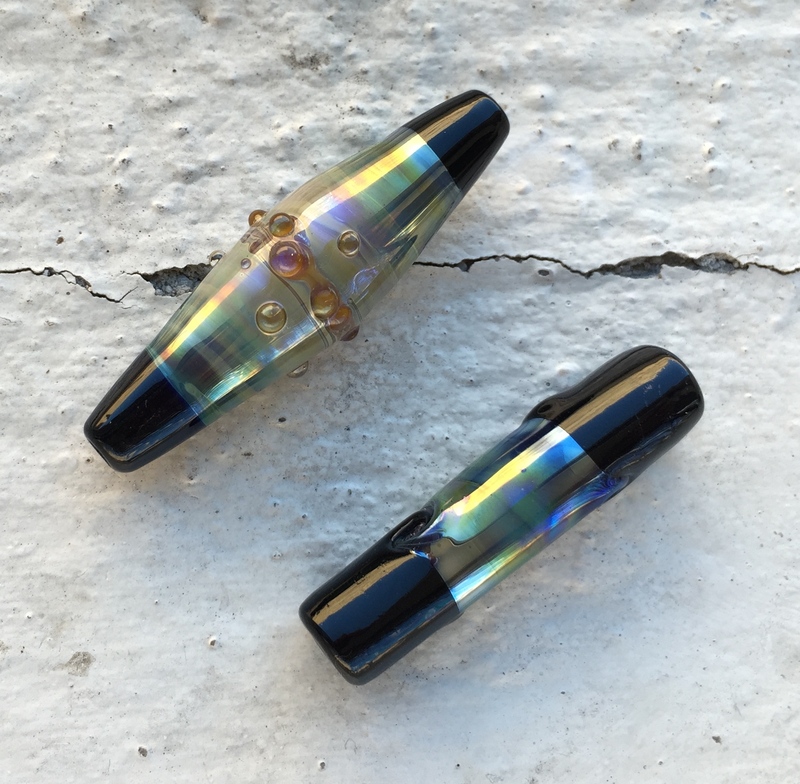 Hades instantly fumed picking up an oilslick appearance, but the reduced dots did nothing special. So I heavily reduced them again and got more fuming on the Hades. Now the dots took on a completely dull metal appearance. 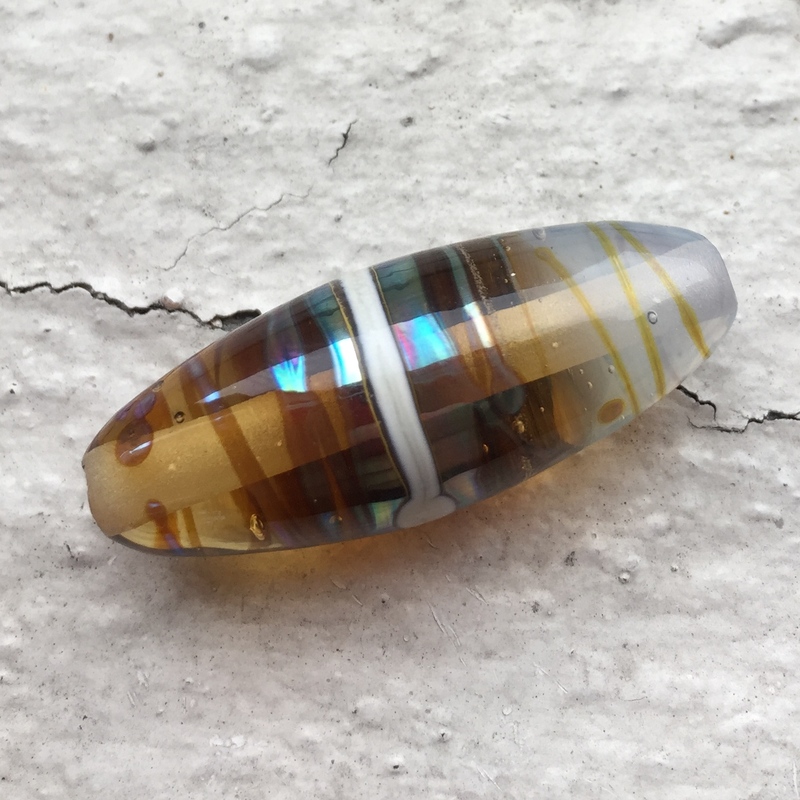 There is no discernible kiln strike on this bead and there was no striking once the glass was encased. I reduced it enough after encasing it and I did not see any difference. These are my favourites and for whatever reason I didn’t take the photo of the “good” side of the tapered bead, but it’s still pretty good! 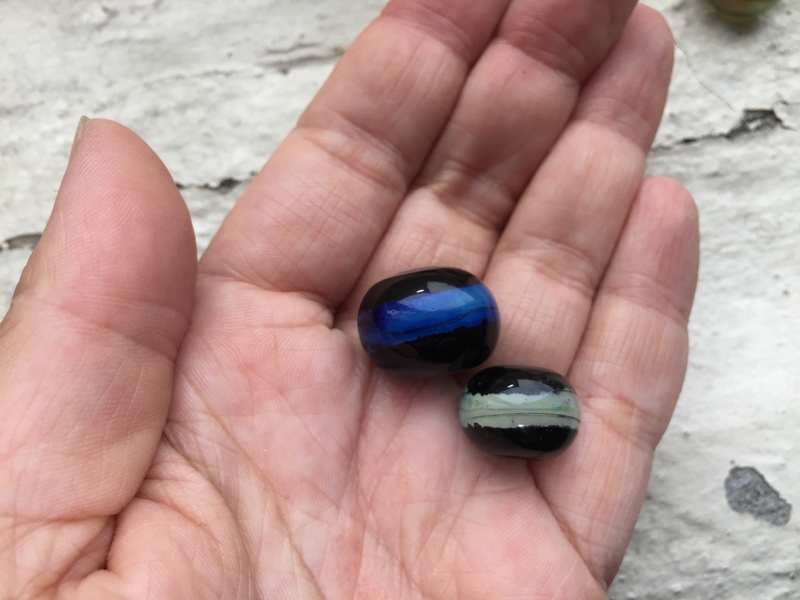 If you’re like me and the sight of jelly opal beads doesn’t really excite you but shiny purpley blue stuff does, then I’ll explain how I got the reaction on these beads pictured to the right. I’ll start with the tapered barrel because I know exactly how that happened. I created the centre of this bead first using a layer of Effetre Striking Orange, (you can see what I was thinking can’t you?). I let this get cold (I stuck it in the ventilation shaft to really chill the bead) then I wrapped Cx.a around the centre, spot heated and did a few twists. I gently heated and marvered smooth. I very gently heated this bead up, rotated it out of the flame until I was sure it was cold (back in vent) whilst I heated a gather of Lauscha clear. Right before I encased I did a bit of juggling and turned up my propane, really LONG yellow cones and just grazed the bead through the top of this flame, I mean… no more than 2 seconds per side. The moment I saw a reaction I pulled the bead out. I had my gather ready, warm but not hot and did a sloppy around the world encasement, marvering it out smooth. I then capped the ends in CiM Hades and shaped in a CGBeads beadroller. 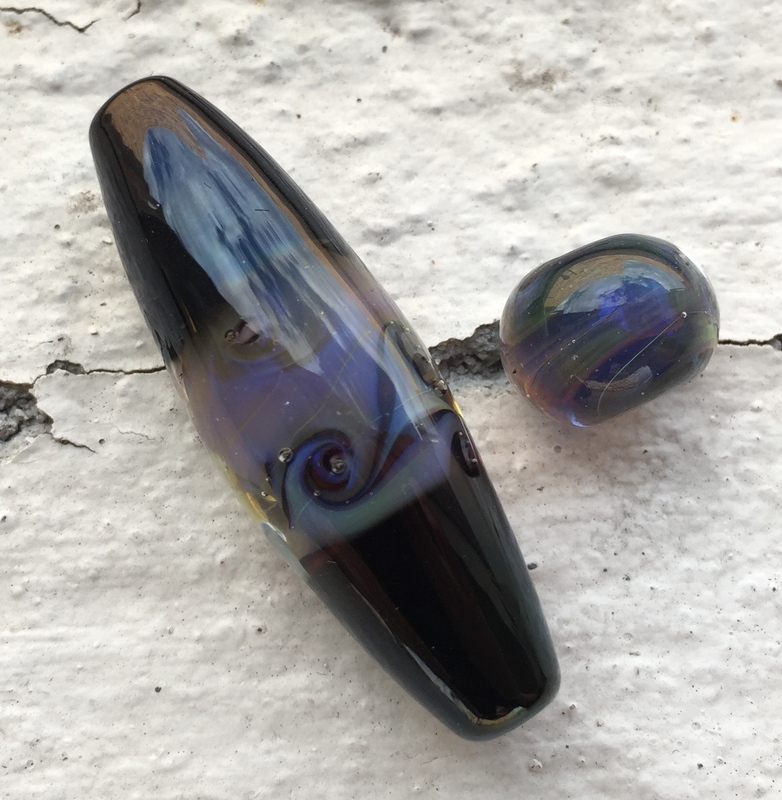 So that is how I got the purple to olive green effect, when you rotate that long barrel bead you can see the a purplish-blue lustre shining through the layers of purple glass. Keep your encasement on the cool side, hot encasing pushes the reaction from deep purple to light purple with olive green undertones. Q. 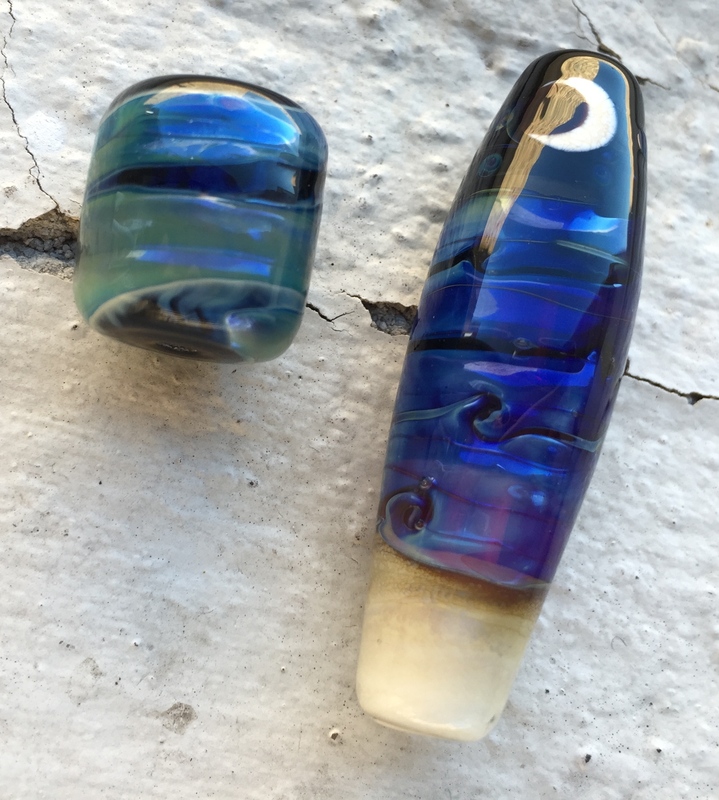 Why does the tapered barrel bead look different to the little blue spacer bead? A. Because of the different colour underneath Cx.a and the brand of clear glass to encase with. Here’s the deal, Cx.a reacts to Lauscha clear. It reacts by fuming the clear glass yellowish brown when used over the top of it it. When used underneath a Lauscha encasing it just looks “fuzzier”. 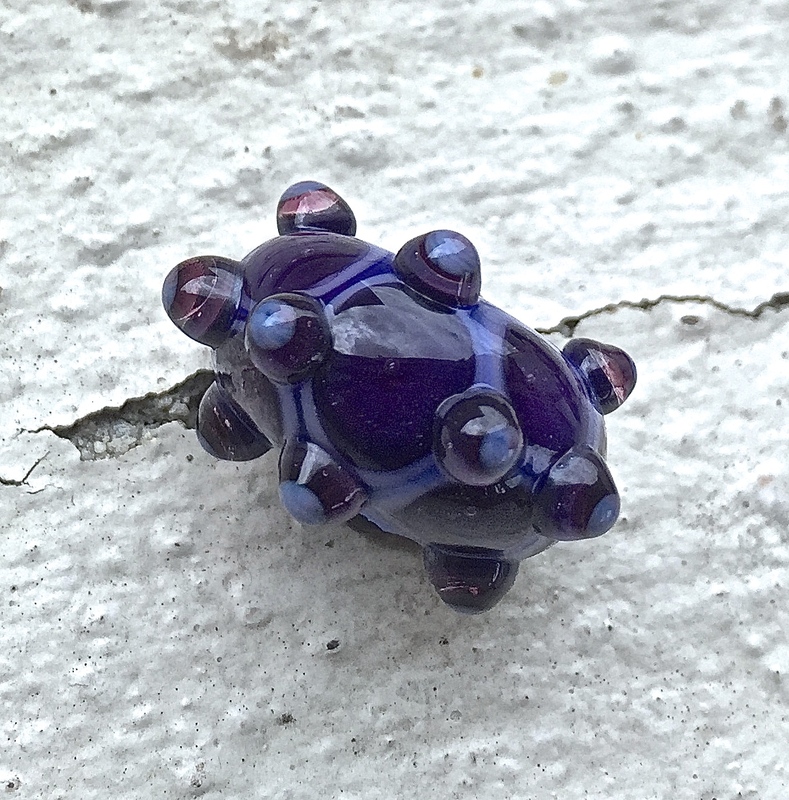 So I made another bead because I thought part of the problem of not getting that superb Paua shell look was what I was encasing Cx.a with. The photo below is a mini tutorial which explains the reactions to heat and clear glass. Sorry the photo of the bead isn’t as bright as I would like it to be, but I prefer to photograph in natural light where possible, even when it’s overcast. Overall I think Cx.a is awesome, if you have it in your stash you’re in for a bit of a wild ride with it. Although hopefully this blog at least narrowed down some possibilities, so you know exactly how to achieve the colours you want with it. It absolutely hated CiM Simply Berry, it just turned a muddy brown on top of it. So my guess is, it’s going to do that on any dark purple glass and probably any pink glass. I’ve run out of the rod to test that hunch. I adored how it looked over Striking Orange, and I think I got more of that lustre effect when I encased with Effetre Clear, it likes it on the cool side although there is great potential for using this glass with the “storming” technique by Amy Kinsch. As far as I can tell, this glass must be struck in the flame. I took before and after firing photos and I can’t see much kiln strike. The rod looks like a root beer colour, until you melt the end and put it into the light. Then all the colour and striations come through. Ek.6 is an awesome reduction colour. My expectations for this glass were not particularly high. I have no idea what the code was for, as I couldn’t find a point of connection from research on the Double Helix website. My assumption is that its a variant or test batch similar to Ekho, but I didn’t really get anything that looked like Ekho based on the stock images on the DH website. The codes for the test glass of Ekho range from OK to TE. So far I haven’t found a point of reference for Ek codes. Not knowing what I had, I didn’t know if it was going to be a “good” looking silver glass or a “meh” looking silver glass. (Please note, good and meh are purely subjective measurements.) Turns out, this is a good looking glass that melts like butter and is very easy to get effects from it. I think this glass is one of those that you can reduce and strike, because of the way I work I find that I’m always striking glass after I have reduced it. I know that in order to get the wispy smokey effect under encasement that a light reduction with a moderate amount of striking is necessary. The left and middle pair of beads are Ek.a testing on Cim Simply Berry(1) and Vetrofond Pale Transparent Green(2), in that order, all encased. The difference is in the strike rates. The bead on the extreme right is Op.6 layered over Effetre Pale Transparent Green and encased in Effetre Clear. The round bead is OP.6 reduced on CiM Simply Berry and not encased. Whilst Op.6 retained the iridescent look when encased, the different base colour meant the overall look was more sea-green than iris blue and the extra heat pushed the reaction along. Double Helix says on its website about Ekho that the glass likes to be “worked hot, cool reduce and encase”, you can think of Ek.a in a similar vein as it responds well to this advice. I worked one bead with very cool encasing and one bead with hot encasing. The reaction was prettier on the cooler bead. It’s a beautiful ethereal glass and when encased looks like captured coloured smoke, love it. So, get Ek.a glass hot, and spread it on your cool base bead, let it cool a lot, then reduce and then encase with gentle heat. If you’re a bit wobbly with holding your bead out of the flame, as you encase you will gently strike the bead as well. This is not a bad thing at all, but be mindful not to overheat and push the reaction along too far. If you use white hot glass to encase, you will push the reaction along to yellow, if you want a wispy colour reaction, cool and slow. If you want a vibrant purple pink (depending on your base colour) white hot glass to encase over CiM Simply Berry (you can sandwich Ek.a between two layers of clear if you want). 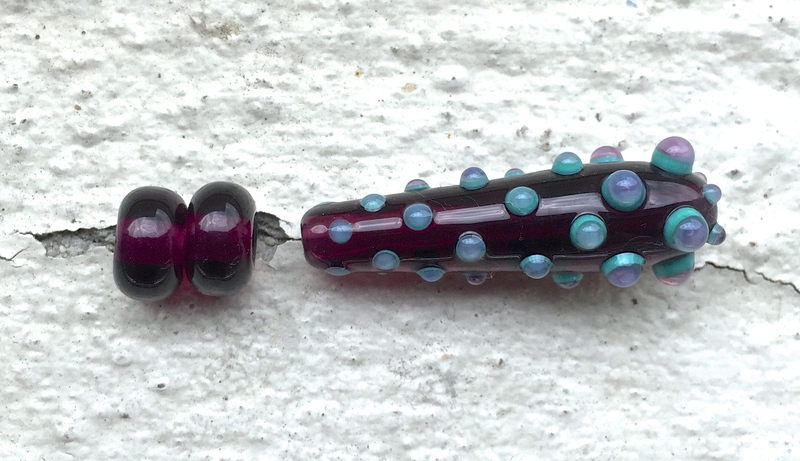 The purple bead has CiM Simply Berry as the base. The other two beads are Effetre Pale Transparent Green. The middle one is encased in Effetre, the other two are encased in Lauscha. I think the difference in colours comes down to how I encased. I had to get the Effetre really hot to create a good encasement (my batch is very stiff), however Lauscha melts like butter and doesn’t need a lot of heat. Ek.a changes colour depending on what is used underneath it. When I used Simply Berry as the base bead Ek.a developed an even purple-ish blue tonality with a tiny bit of opalescence (I mean tiny, just here and there little patches, you may be able to see it in the photo to the left). When I used Vetrofond Pale Transparent Green, I got more of the yellow, blue green smokey look with a hint of opalescence floating around the bead – lovely effect. I think Ek.a looks best on a transparent background if encasing, perhaps because I’m particular to the wispy smokey effect. 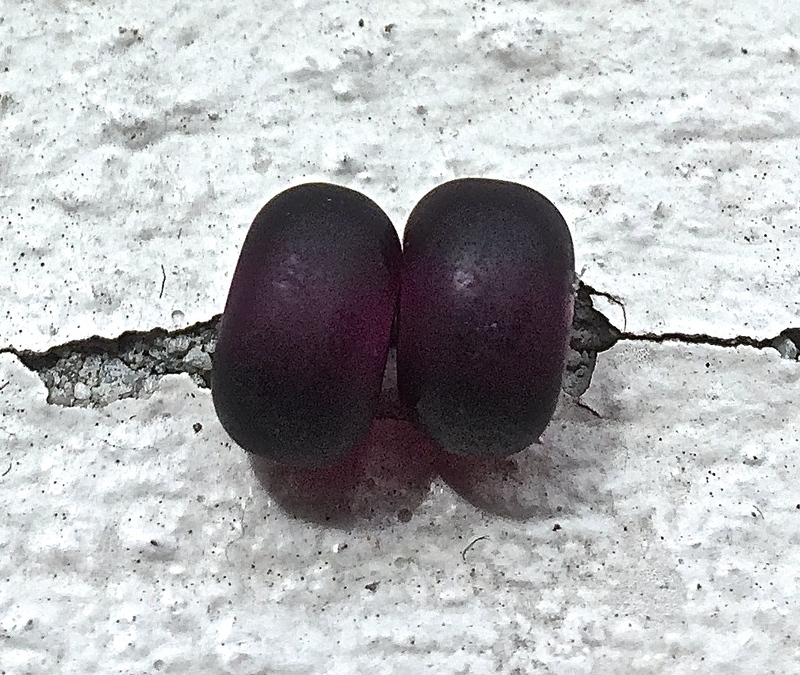 These three beads were not “sandwiched” between clear glass. I did more testing in 2016 and found that if you place a layer of clear over your base colour you can keep a lot more of the opalescent effect after encasing instead of the wispy effect. Important to note, this is a colour that kiln strikes very easily. It also strikes very quickly in the flame, work it very cool and slow and let the colour develop in your kiln if you have a long garage time. In my kiln, the test beads for Ek.a did develop a more colour, so I have learned to only just strike it and let my kiln do the rest. Like Ekho, you can encase this colour and strike it further when encased. I overstruck Ek.a and again, wow, the difference between the base colours. It stayed a greenish colour on Simply Berry and went all the way to butter yellow on Vetrofond PTG, see the long photo above. This is the Ek.a over CiM Clockwork, its hard to photograph but you can just see that there are sections that turned pink. Pop Ek.a over transparent orange glass (it will look pinker if you encase the trans orange glass in clear first), encase in Ek.a and bam, this colour goes hot pink. I didn’t have trans orange, I’d run out. I used Ek.a over CiM Clockwork and it has some hot pink tones but CiM Clockwork is too opaque for that really awesome hot pink effect. (Photo has been updated, I’ve run out of glass to do another bead testing it over Striking Orange, but you get the idea. It works well over orange toned glass.) I’d like to try it over something like an amber or peach transparent to see if that gives me pink as well. Ek.a is a seriously good, versatile glass. If you managed to get some in your stash, hoard it. If you didn’t get any, maybe arrange a swap with a generous person for something that they don’t have. Lastly Ek.a has a lovely reduction effect if not encased, it mirrors up beautifully. 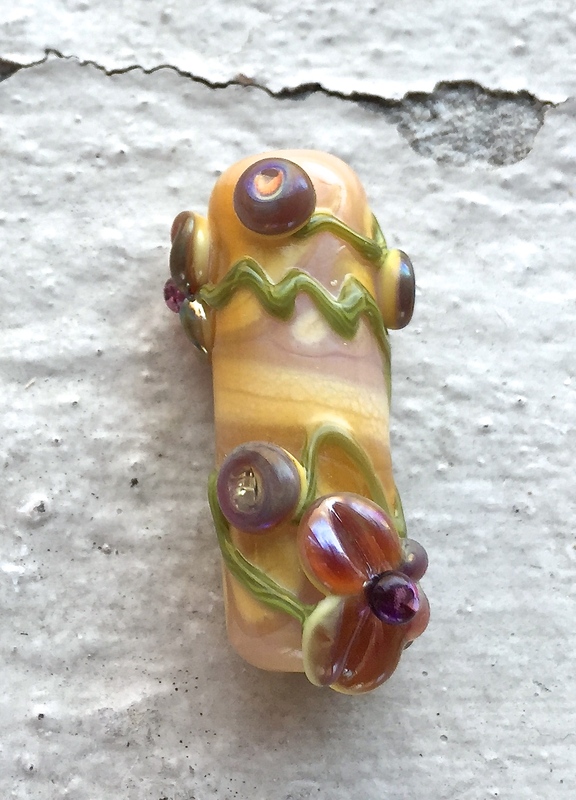 The flowers on this bead have been layered over Effetre Dark Ivory. I heavily reduced it without encasing and I got a gold reflective surface on the first pass. The second pass of reduction caused raised sections to turn a reflective salmon pink. Super gorgeous. I wish I had more of this colour. Op.6, Ossa variant rod. This glass is shocky and fractures easily. You can see where I’ve stuck my rod back together. 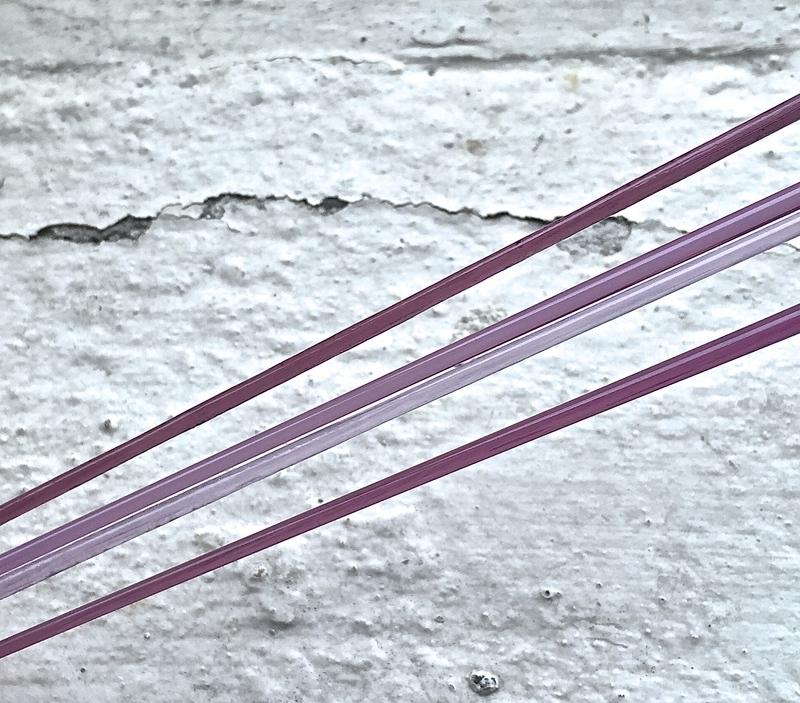 I picked this rod up first to test because it is dark purple, which is one of my favourite colours. It looked like it had stars all the way through it, which is pretty cool. Ossa rods have some sort of silver inclusion within the rod. This means that when you use OP.6, the inclusions seems to shift colour from silvery white to reflective purple or blue depending on the base colour underneath. I didn’t have any expectations from this rod and I wasn’t sure if it was reducing or striking. After a quick google search I realised it was a variant of Ossa and a reduction glass. Now, I’ll be pretty honest here, whilst the idea of a silver glass with somewhat reflective inclusions is a cool idea. The little spots really didn’t do much for me at first as I couldn’t shake the impression that it looked like a whole bunch of bead release was stuck in my bead. This particular rod liked to randomly break in sections. It does shock a lot, so make sure you preheat it. As I was working in the flame, chunks of Op.6 would break off the main length of rod. It was really frustrating because it meant I had to stop, spot heat and remove the chunk and my rod kept getting shorter and shorter. So what did I discover from that? The parts where the rod broke and left a thick blob, which then had to be spot heated to remove some glass created different reactions to the beads that weren’t spot heated. Spot heating is bad (in my opinion), unless you want lighter green blotches in your design, I’d avoid spot heating. 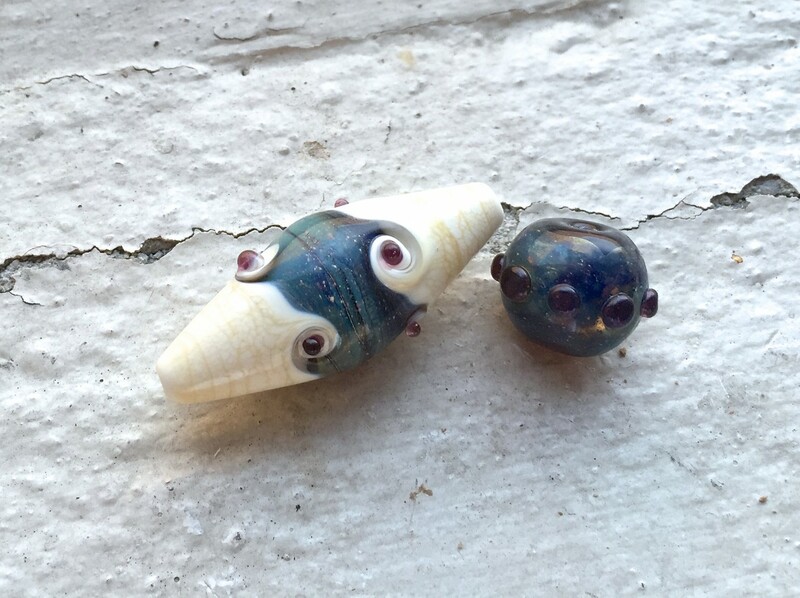 Two test beads straight out of the kiln. Natural light photography on a black background really shows up the colours in these beads. But, this one on a white background was better for contrast. A thick layer of Op.6 looks better when not encased. When gently reduced and not encased Op.6 develops a dark shifting purple, blue-green oil slick appearance and some of the white speckling disappears. The more reduction, the darker and more metallic the appearance. A thin layer encased and heavily reduced will give a strange blue shifting to green and yellow opaque look to the beads, I think of Magellanic Clouds, and I started to like this glass and Ossa in general a little more because of the starry night sky effect. I personally like the reaction I got when this colour was applied thinly and very gently reduced before encasing. I really liked Op.6 encased over CiM Simply Berry, the white speckles in the glass reflect the purple plum colour which is a nice contrast to the blue green iridescence. A thick layer encased (and reduced for more than 30 seconds) means you will lose the iridescent look and the blue green blend will be more opaque. Significant points to note, Op.6 needs a reduction flame (and a very gentle wafting in and out) to get it to go metallic. When encasing after reduction, don’t overheat (go slowly, super hot encasing strikes Op.6 too quickly to green or worse, yellow). I had no trouble encasing with either Effetre or Lauscha clear, they didn’t seem to effect any significant changes. You can’t “over reduce” Op.6, it will just go a darker metallic colour, but you can push the reaction along too far if you encase too hot. You will end up with wishy washy green and no opalescent iridescence if you over heat after encasement. 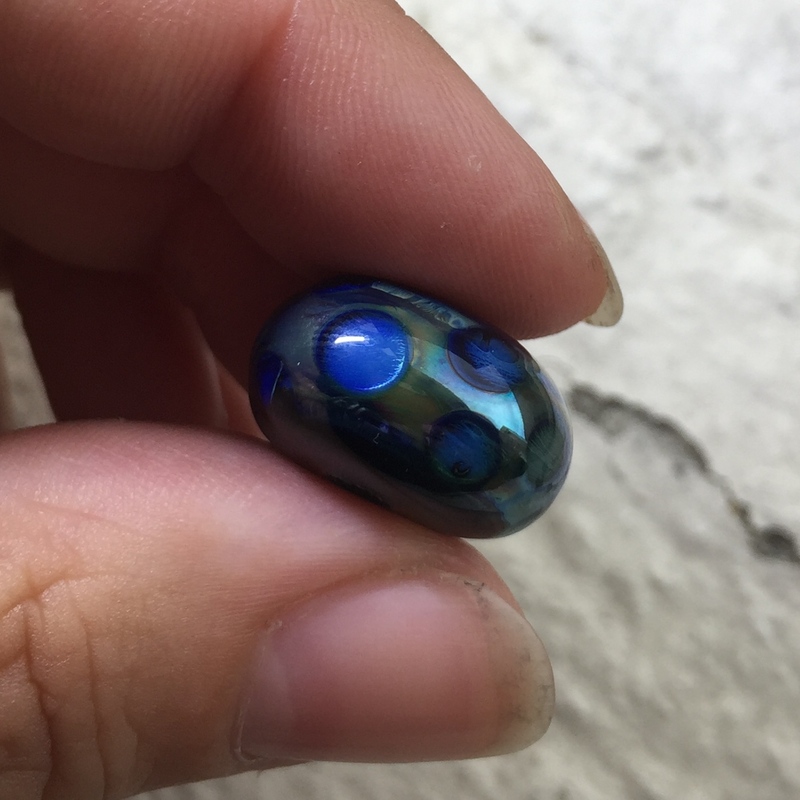 To keep the iridescence when encased, cool encase, do not get that bead overheated, I found it really hard to do on a bigger bead (small beads are easy) and you will need a lot of patience. It will be slow going to encase Op.6 and keep the iridescence, you will have to be very patient in smoothing your encasing out slowly. So if you want an oil slick look, its easier not to encase. Op.6 responds to cool marvering to slow down the reaction if you have accidentally over heated. Encased Op.6 beads should not be left garaging in your kiln at a hot temperature as they strike to yellow or pale green. Edit: December 2016 I tested out big beads using various Ossa variants this year by leaving them garaging for four hours and they were fine, but my garage temperature was on the cool side. Two very large lentil beads using a mixture of Ossa, Ekho and Op.6 glass throughout to give a night sky effect. The base colour used in both of these beads is CiM Simply Berry which in my opinion is pretty much the perfect base for Ossa. Op.6 looks really good for night sky effects and the white speckles reflect the tone of the base bead, but if you want that look, keep it applied thinly. The thicker the application the more white “speckles” and the speckles won’t do that cool colour shifting thing. Op.6 looks better (in my opinion) with a darker base colour to capture that iris blue green iridescent look. Edit: December 2016 I’ve since discovered that Op.6 gives you more of a purple to green oil slick iridescent look than any other type or variant of Ossa I’ve tried when used over darker base colours. I personally prefer Op.6 over CiM Simply Berry because the darker transparent gave more of a colour range (hints of purple and deep blue) than the lighter transparent (more overall green and blue tonality). Whilst I have a lot of Ossa, I don’t have any more Op.6 and I wish I had another rod to make a few more beads as I think the colour you can get from Op.6 is superior to Ossa. OP.6 is my favourite version of Ossa after experimenting throughout 2016 with different test batches of Ossa. Regular Ossa is lighter purple in the rod and tends to the blue – green spectrum of the colour reactions. It is easy to encase and maintain the opalescence. The darker the rod the more purple – blue the reactions are, which is what I prefer, this is Op.6 and is harder to get an opalescent look encased. The royal blue rods of Ossa that are in the 2016 garage box will not give you any oil slick appearance at all and tend to the sea green – pale green range, however, they will give you a really beautiful opalescent sheen when encased and will do so very easily. When I originally began this blog post in November 2015 I had no idea that it was going to get so big and difficult to navigate. I had no idea that I would write so much on the testing phases. I had no idea that 2016 was going to be one of those years that I didn’t have much time to devote to glass bead making. One thing that consistently annoyed me was just how big and cumbersome this particular blog post had become. A full year later, as a way of cleaning my mind and my studio; I have split the blog posts up. In the process, I have updated them all with further information I discovered throughout the year and I have also taken the time to update process areas that felt vague. Each rod of glass tested now appears in its own blog post. You can bookmark this post to navigate to them through the links below. This testing was an adventure for me, being only a somewhat user of Double Helix glass, a full year later and I am now a thorough devotee. The initial stash of rods that kicked off the testing phase. 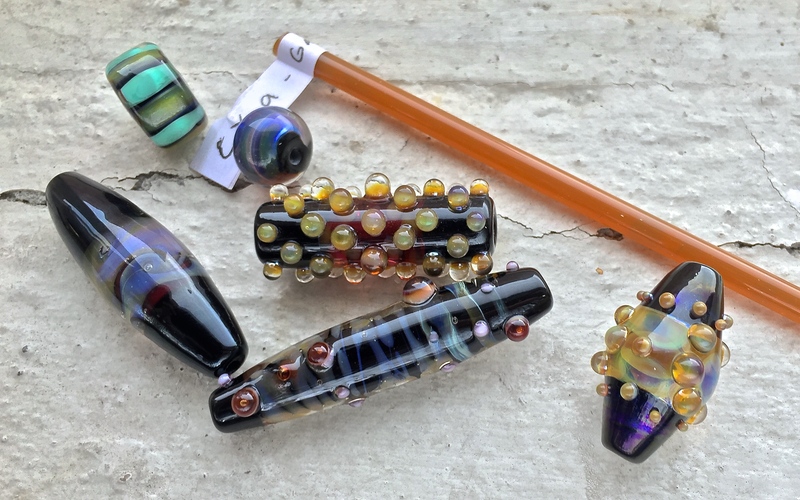 Most generously, Natalie Monkivitch of Beadmonki Lampwork gave me one rod from every bundle in her 2015 Double Helix Garage Box as a gift last December. I didn’t want the gift to go to waste, languishing on a shelf and never using the glass because I didn’t know what to expect from it. 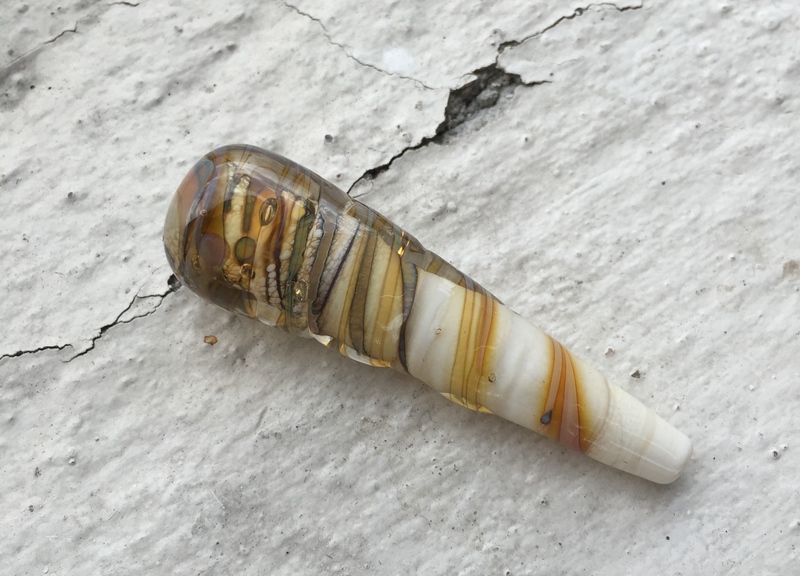 I know I’m not the only glass artist who feels that sometimes glass is too precious to use, so I began to test and write up my findings. I am very slowly working my way through doing the testing on all the Double Helix glass I have. I thought I would begin by tackling the pile of rods that Natalie gave me as a start. I think I was overly ambitious. At the time I began this blog post it was the end of the 2015 Australian school year and as a VCE English and Sociology teacher, I have my work cut out. Additionally, it is summer and my studio can reach 50c (122f) with the torch and kiln on. So the blog posts have been slow to update. 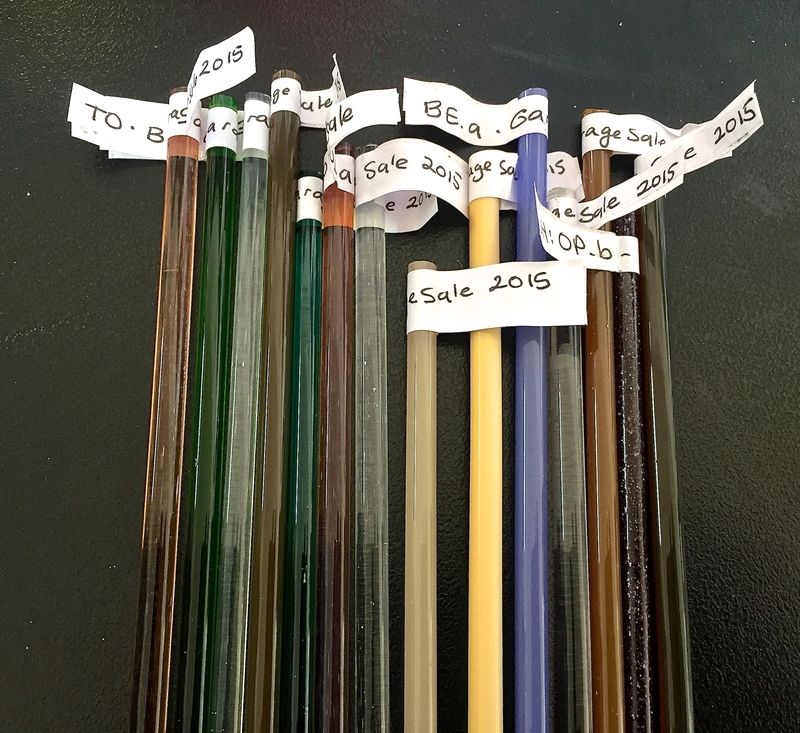 This blog post will be updated each time I have done the testing for one of the colours in my lot of sample rods. As I have gone on, I’ve found this original blog post become far too long and unwieldy and this post is a contents page. I have included my research (educated guesses) into what the variants could be. The tested glass now links to its own page, rather than following on from this main blog. Click the links to open up to more information. This particular blog post is only devoted to the garage box glass from 2015. I do not have every combination that was sent out with the DH garage box. So if you have glass that is not listed here, but would like to replicate my formula to make your own test beads I explain my process below. Feburary 2015 Edit: I have received another generous load of rods for testing as another Aussie lampworker sent me one of everything in her stash and they are different to this stash! So I’ll have another blog post out with “batch 2” glass information. Apart from DH Terra (all types), ASK Silver Cinnamon, DH Triton and Reichenbach reduction glasses I am not a big user of “silver glass”, it is not that I don’t like it. I really like everyone else’s beads made with silver glass, I think my beads are not particularly exciting when I use it. So I haven’t done a lot of experimenting with it. The samples so generously sent to me as a gift is such good motivation to get some experience up and pass on some knowledge. I’m being very thorough in this testing, because that is how I learn best and this is way outside of my comfort zone. Going through my stash last night I discovered that I have a few bundles of some test colours from Double Helix that looks like they were produced in 2013 that I haven’t touched. I’ll devote another blog post to those colours in the future and link back to Double Helix’s records of their glass. Enough of that though, on to the important information. For the purpose of testing I am doing the following, dark transparent base, light transparent base, encased, not encased. I will also photograph any non test beads and explain what glass has been used in combination. By keeping my base colours systematic I should be able to do some comparisons and demonstrate if the glass does anything different if exposed to more or less heat, longer striking/reducing times, etc. I will make a note with each photograph what the glass used in the test was, so that if you want to replicate the reaction you can reliably do so. 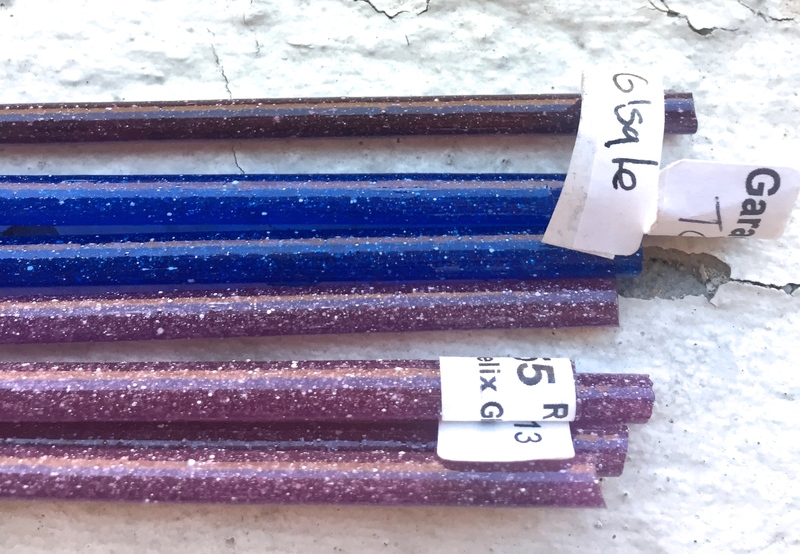 I have chosen these particular colours as I know that they are good backgrounds to test Double Helix glass on and because I think that I often play it safe if I’m making beads because I want them to sell and fund my glass addiction. Bear in mind I do not go “flame to kiln” with my beads, I batch anneal. Based on testing my kiln, some of the DH garage glass does not strike in my kiln and some of the glass has had a small amount of striking from the kiln. Therefore, what you must keep in mind is that the colours I get are predominantly from flame striking. Garage times will impact your finished colour. 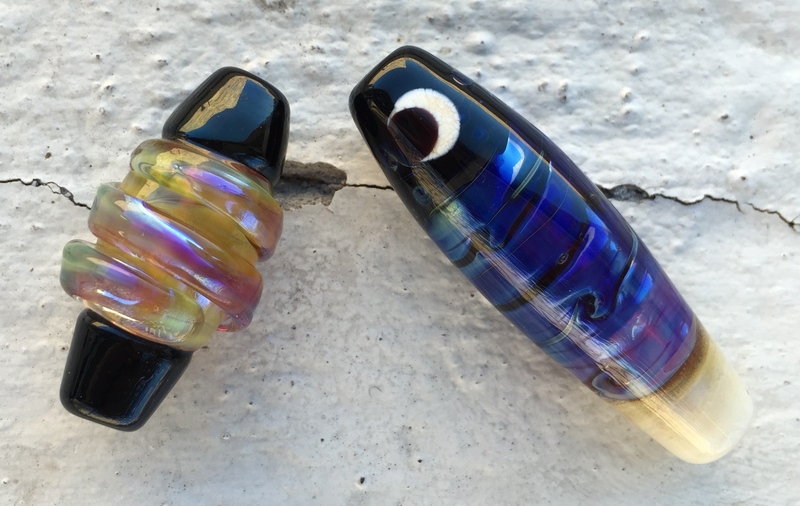 If you are garaging for very long periods of time, certain glass will need to be used in your torch session toward the end because it kiln strikes easily. I explain if the glass is quick or easy to strike in the flame as I go through each rod. 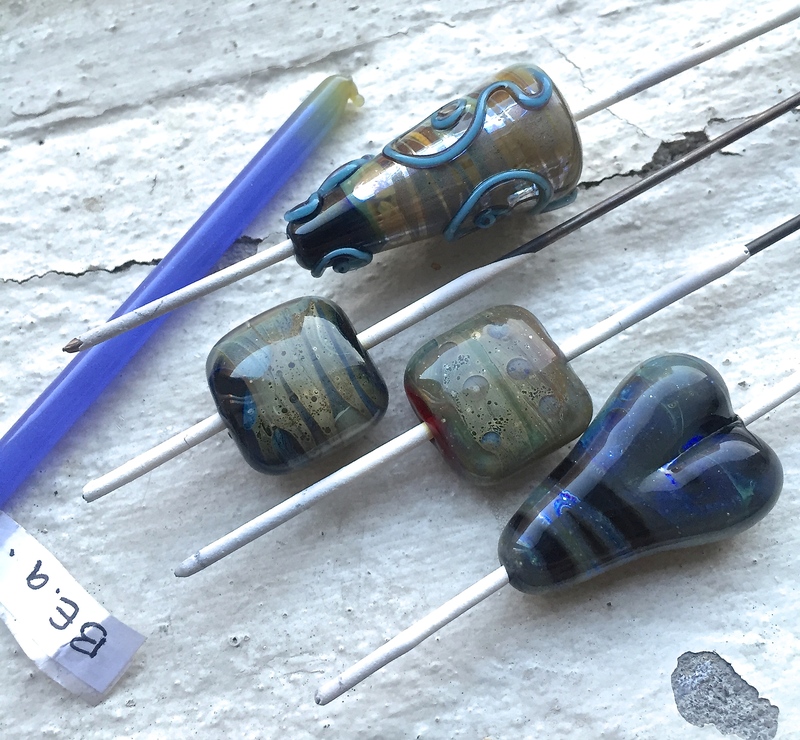 If your beads are changing colour dramatically after coming out of the kiln this blog post may help troubleshoot some of the problems. A bunch of test beads straight out of the kiln. Natural light photography on a black background really shows up the colours in these beads. I decided that I would use a few different base colours to test the silver glass with and I chose some that were traditional and some that are a little out of the box. A dark transparent (CiM Simply Berry) a light transparent (Vetrofond Pale Transparent Green or Transparent Orange). 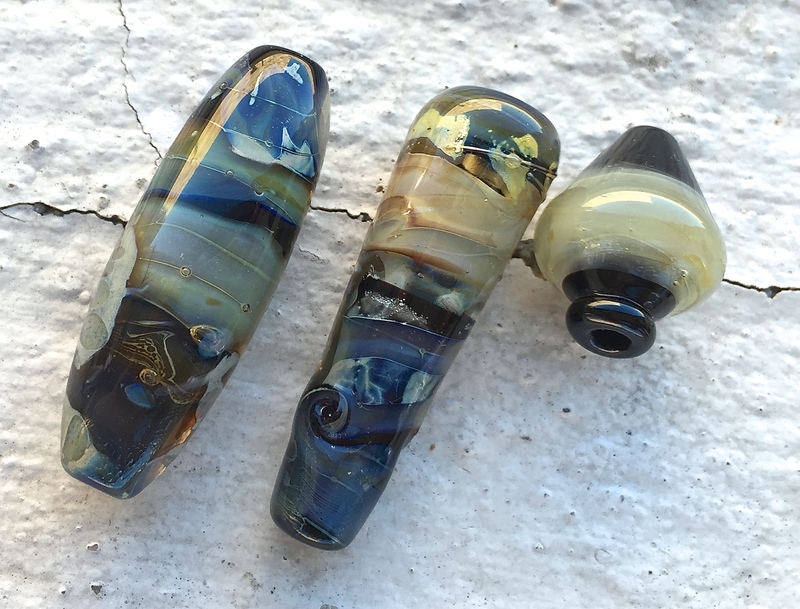 For my own bead making I also use a dark opaque (CiM Hades, Vetrofond Black, Effetre Black) and a light opaque (Effetre Dark Ivory), but sometimes I have used other colours and that will be noted. I don’t test all the colours on all the different bases, I try enough to get an understanding of how the glass works. I have used Effetre Pastel white for some of the testing, but mostly what I’ve discovered is that its not great for some types of Double Helix glass because it does not produce enough depth for reflection. Therefore it is rare you will see a test bead with Effetre Pastel White as the base, although you will see some with Dark Ivory as the base. Edit: December 2016 – Throughout the testing it has become clear to me that CiM blacks react differently to Effetre and Vetrofond blacks, my guess is that Reichenbach Black will also create effects. I have been clear in my testing where I have used what black and why. I encase with either Effetre Crystal Clear or Lauscha Superclear, the reason for the switch up is because I read that different brands of clear can actually impact the final colour reaction of some Double Helix glass. For instance I have read (and seen) that in some cases there is difference between Aether and Zephyr encasements for some Double Helix glass. When I do the garage testing for Aether I will make two beads up, one encased with Aether and one with Effetre Clear and Lauscha Clear with a non garage box glass, probably Triton to show you the comparative differences. As I don’t always use Aether or Zephyr for encasing and I don’t want to limit the tests to having this glass I am relying on “staple” clear glass that everyone can get their hands on. 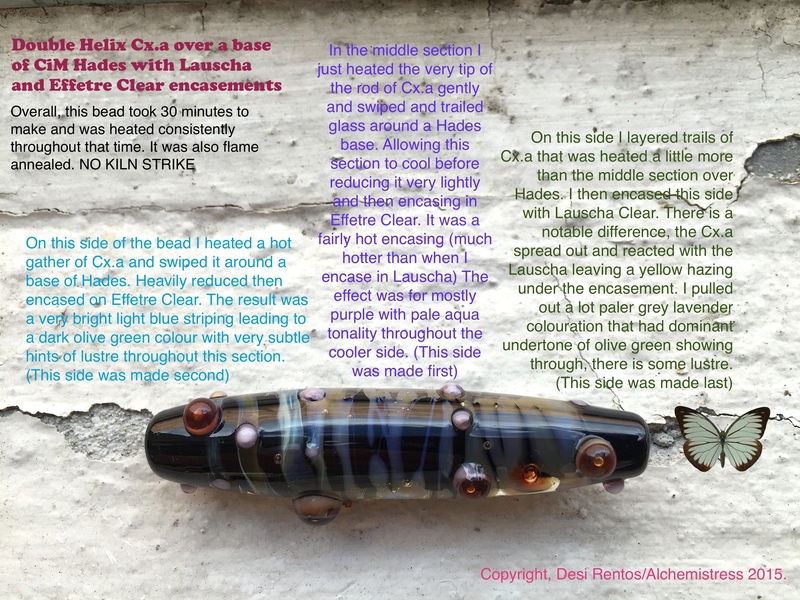 Edit: December 2016 – I now know that Lauscha superclear does some funky things to Double Helix glass and I have made it really clear throughout how it effects each of the colours. What really interests me is how you can completely change the quality of a particular rod of glass simply by encasing with Lauscha. It opens up a door into another realm of bead decorating. I am not the best photographer. I photograph my beads as well as I can but often, the photos are sometimes not clear, which means I have to go back and do them again. I spend a long time taking photographs, but one thing I am clear on there is no photo manipulation, I crop photos and upload as they are. All photos used on this blog look true to the colour of the bead. I try to photograph in natural light always and where that isn’t possible I have identified what the lighting conditions are. 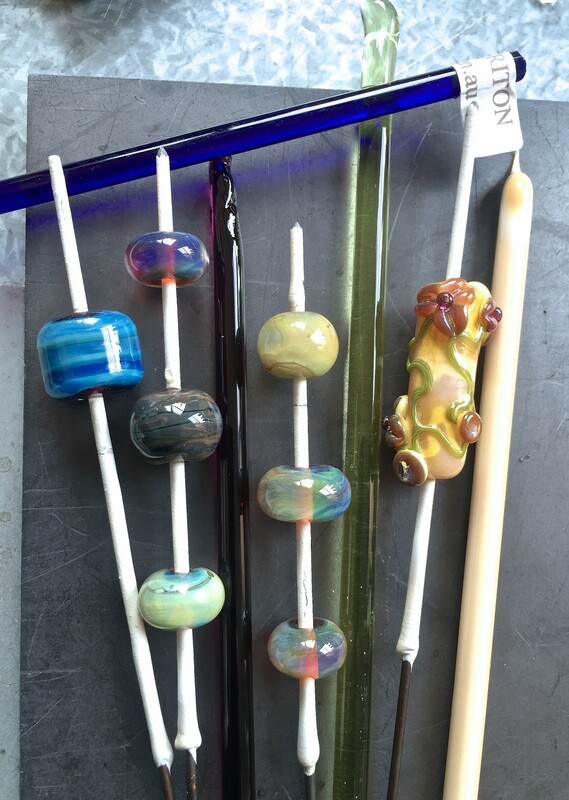 Photography of the glass will sometimes demonstrate before kiln and after kiln shots of test beads. 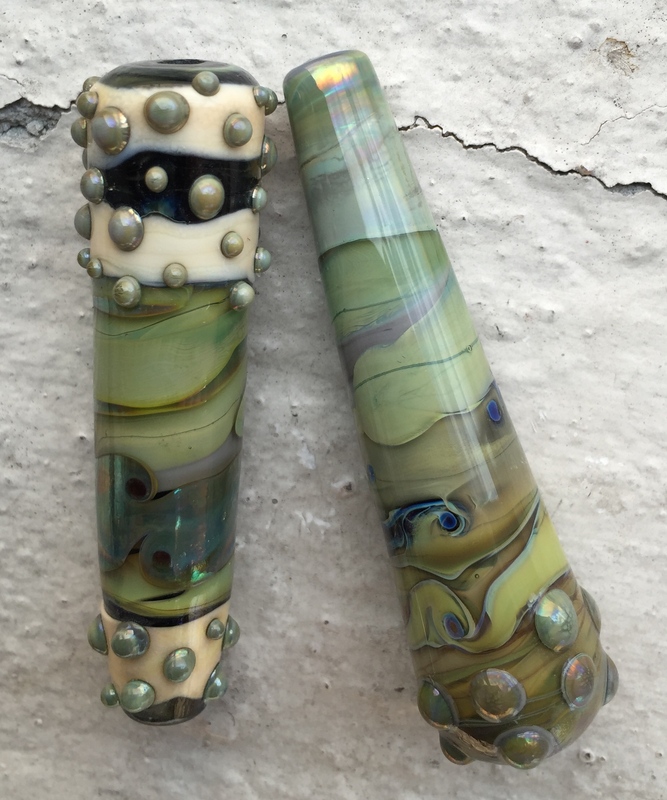 I also have some videos on beads that showed remarkable kiln strike or change after annealing or just beads that I think have had a really good reaction. I link to the videos on my Instagram account, through the blog. So if you see a link in the blog you can click it to access a video of the bead. The video quality is not bad and you can tell a lot more than from a static photograph. Thanks for reading my blog, please bookmark or check back regularly as the Double Helix blogs get updated irregularly. Stringer made with CiM Simply Berry. Top: Simply Berry blended slightly with Effetre Trans Violet. 2. Blended with CiM Peacock Green. 3. Blended with CiM Cirrus. 4. Simply Berry stringer. CiM Simply Berry or simply boring? Simply Berry is a transparent purple-ish red that is an exact colour match for the flesh of ripe blood plum fruit, or claret, or port-wine jelly. Well okay then, still not excited? It is completely unique to the COE104 glass colour range, there are Effetre colours close to it, but nothing exactly like it. So its important to know that it cannot be substituted and it’s impossible to hand blend a colour similar to it. Its a dense purple that looks pretty good against green, blue, tan/brown and grey glass and is right at home next to the CiM range of pinks, any pink really; it just works with pink. Simply Berry is a staple in the CiM range of glass colours and whilst it’s not particularly exciting, its a nice colour to have on hand. 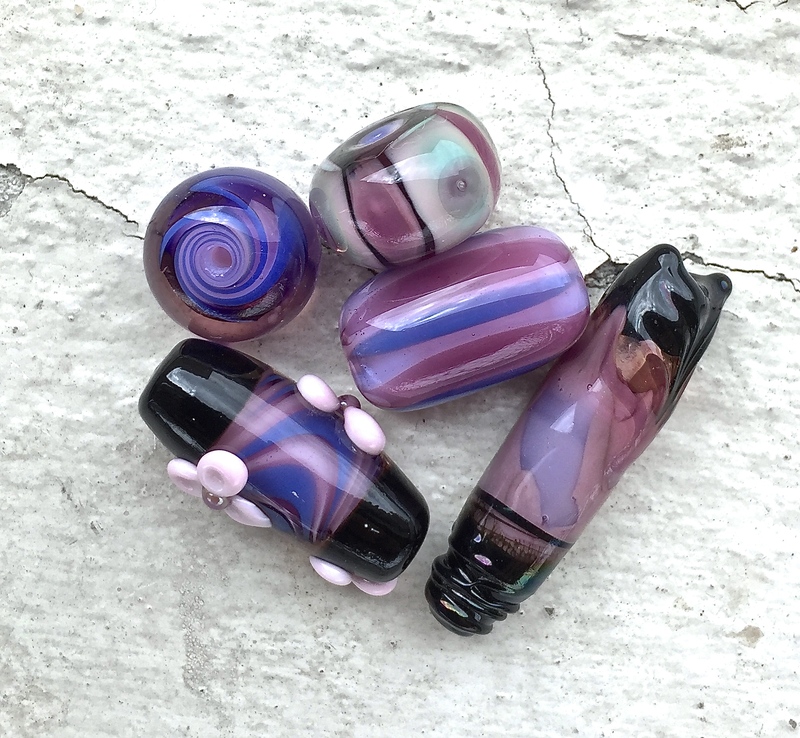 At first Simply Berry appears to be one of those really intense purples that will look black if used all on its own, but it’s not at all like Effetre transparent purple or red toned glass. Effetre transparent purple and red glass seems to have a blue or brown undertone to it. Whereas CiM Simply Berry has a pink undertone, which probably accounts for why it is one of the more expensive transparent purple-ish colours. 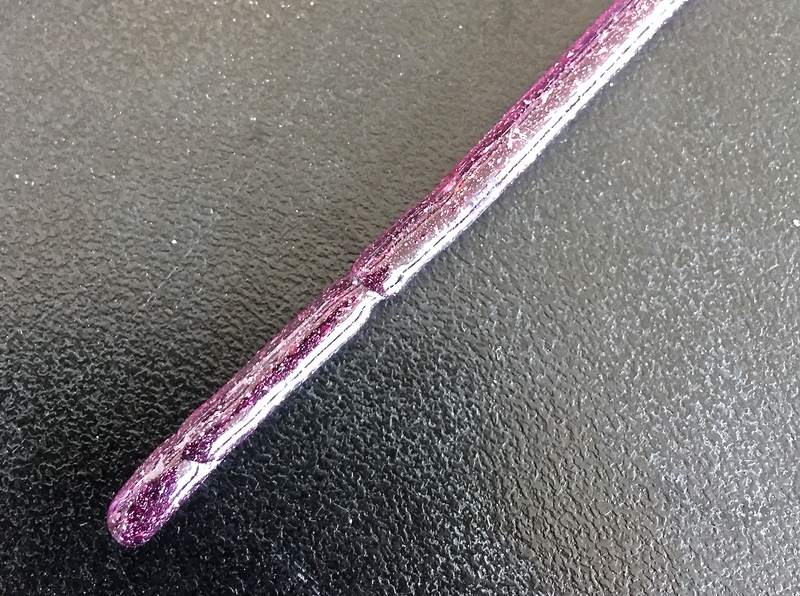 This means that when you layer it or pull it into stringer, you’re not going to get glass that fades out to lilac or bluish grey, it will stay a purpleish red colour. This also means that it can be used more frequently for dot design over darker colours than other really intense transparent purples because it doesn’t look black. A mixture of beads made with CiM Simply Berry, CiM Rose Quartz, CiM French Blue. The bead at the top with the pale green stripes is a base of Simply Berry, then Rose Quartz then alternating CiM Celadon and Simply Berry dots. The black is CiM Hades. Simply Berry has a light transmission quality about it that means it doesn’t look bad at all when used all by itself in a spacer bead, it doesn’t look too dark or black, it looks just like it does in the rod. Its also looks great etched. Simply Berry is one of those transparent glass colours that looks good all by itself when pressed into a shape because of how it refracts light. The rods are stiff compared to other CiM colours, but not as stiff as transparent rods in other brands. Simply Berry prefers the cooler temperature ranges of your torch so that it doesn’t bubble up in the flame. It shows its berry colours best when layered over something lighter than itself. CiM Simply Berry layered over CiM French Blue. The base bead is Effetre Periwinkle. A really changeable colour! However, Simply Berry is a changeable colour, it looks really different depending on what it is layered over. Over lighter opaques (I tried it over CiM Rose Quartz and Effetre Pastel White) and encased in clear it washes out a little and has a raspberry purple tone to it. I layered dots of Simply Berry over CiM French Blue and encased in clear and the result is that it looks very close to Effetre Dark Premium Violet (trans). Layering it over blue or green opaque glass makes for interesting colour combos. Its handy to know that Simply Berry washes out to a pinkish purple colour when layered and striped over pale opaques as that will make a difference to encased stringers. Seriously deep etch achieved after five minutes in Etchall. Oops, I forgot them in there. When I used Simply Berry over Effetre Anice White I noticed a few things, firstly Simply Berry wants to bleed over it and secondly it develops a dark reaction line. In fact, when super heating Simply Berry and Effetre Anice White I got some interesting curdling reactions that looked as if Simply Berry was trying to web out over the Anice, I really didn’t expect that. I had similar curdling reactions with Effetre Ivory. Simply Berry when used in your own home made frit is pretty dark, so use it sparingly in blends. The odd thing about Simply Berry is that when I used it as stringer design it didn’t seem all that dark. I decided that it looked better when it was used to encase a pale opaque colour for stringer design. I also prefer it layered over Effetre Ivory rather than white, the colour just looks better to me for flower petals and dots. Right: Simply Berry over Effetre Light Ivory flowers. Left: Stripes of Simply Berry over Effetre Periwinkle (the other stripes are Celadon). Simply Berry encased over Effetre Pastel Pearl Grey as raised stringer design. The long bead is a base of Effetre Pastel White, encased in Simply Berry. Double Helix Triton is striped over the Simply Berry and all melted in then all encased with Effetre Superclear. Flowers are Effetre Pastel White and Simply Berry. The round bead is stripes of Effetre Periwinkle and CiM Rose Quartz encased in Vetrofond Transparent Pink, then encased in CiM Simply Berry. So with all of that in mind, I thought that there might be something about Simply Berry that makes it a bit more special than just another pretty transparent purple glass. I broke out the Double Helix silver glass and started experimenting and what I found is those silver glass colours which have an original rod colour of dark purple, blue or tan brown react very nicely when layered on top of Simply Berry. Depending on the type of glass (striking or reducing) the reaction lends itself to the purple-blue range of colours of the silver reaction, probably because the transparent berry undertone is filtering through the silver glass layer. The centre of this bead is made with the stringer blend that resembled Crocus. It’s a different sort of reaction when comparing silver glass layered over opaque black glass or lighter coloured transparents or even Effetre purple transparent glass. My post here about my DH experiments talks more about the specific colours used with CiM Simply Berry. CiM Simply Berry is a good all rounder. Its a smooth melting yet, fairly stiff transparent glass that is the perfect “port wine” colour. It works really well as a base colour for “raku” frit and can be encased deeply with no problems. Its a dependable colour and a good one to have on hand if you’re looking for a purple plum colour that works with pink glass. Simply Berry covered in Reichenbach “Raku” Frit in size 1 and then encased in Effetre Superclear. I’m surprised by how nice it looks!